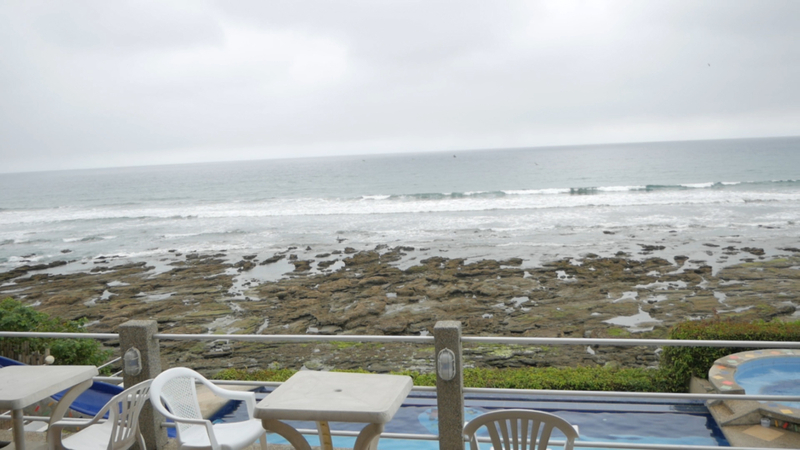 We LOVED LOVED LOVED our stay at Villa de Los Sueños in La Entrada, Ecuador!!! It was beautiful, relaxing and muy tranquilo! 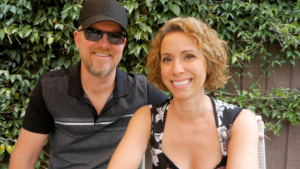 The current owners of Villa de Los Sueños, Marsha and Shell, are amazing hosts and went out of there way to make sure a couple of vegans felt right at home. They even picked up some non-dairy milk on a trip to La Libertad to get a new hot water heater and they made a special vegan lasagna for us so we could have dinner with the other guests after a long day of whale watching. We’re already planning our return trip! 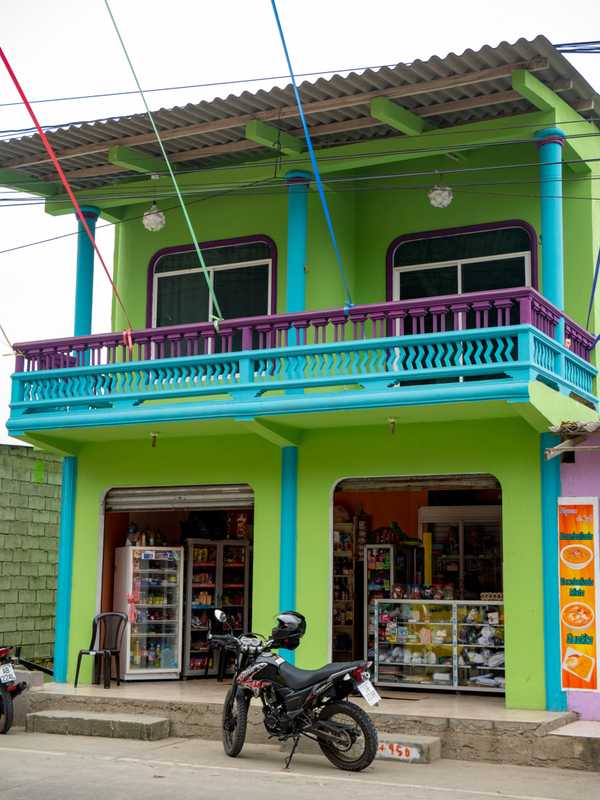 La Entrada is a quaint little pueblita (little town/community/comuna) located about 20 minutes north of Montañita, Ecuador. 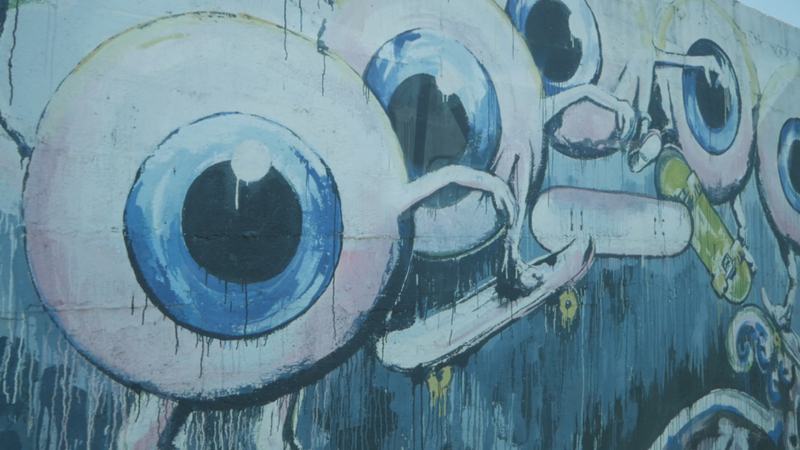 The comuna has been rejuvenated with colorful buildings and more than 2 dozen murals painted by Ecuadorian artists. 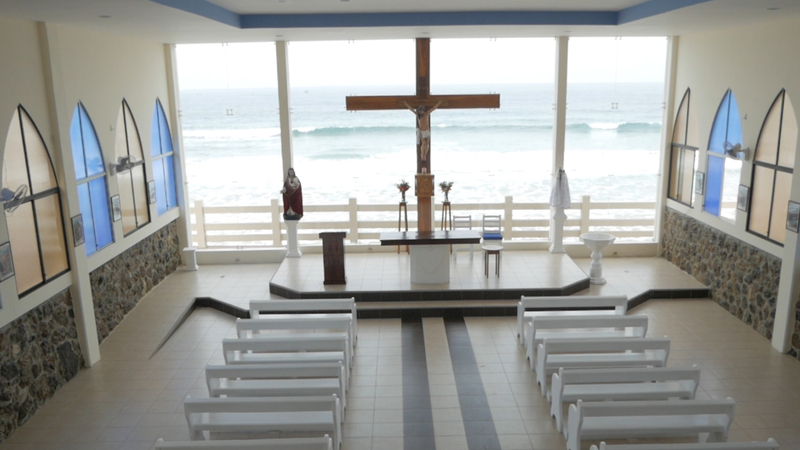 It’s also a great destination wedding location, as you’ll see in the church pics below. 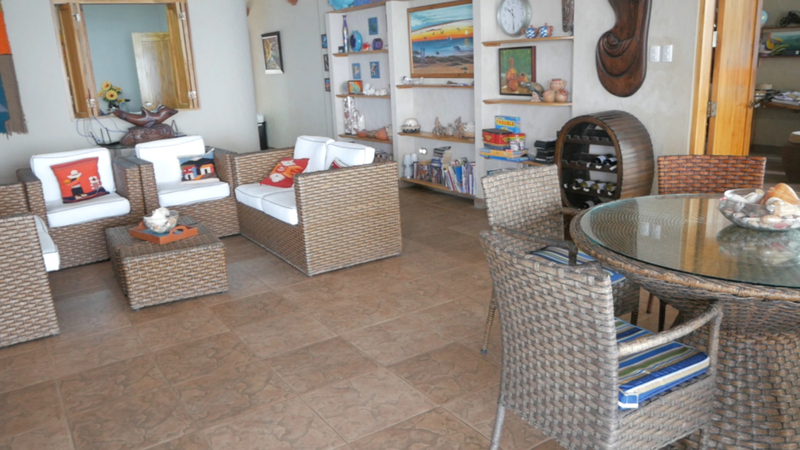 We hope you enjoy the property tour of Villa de Los Sueños and the walking tour of La Entrada, Ecuador. 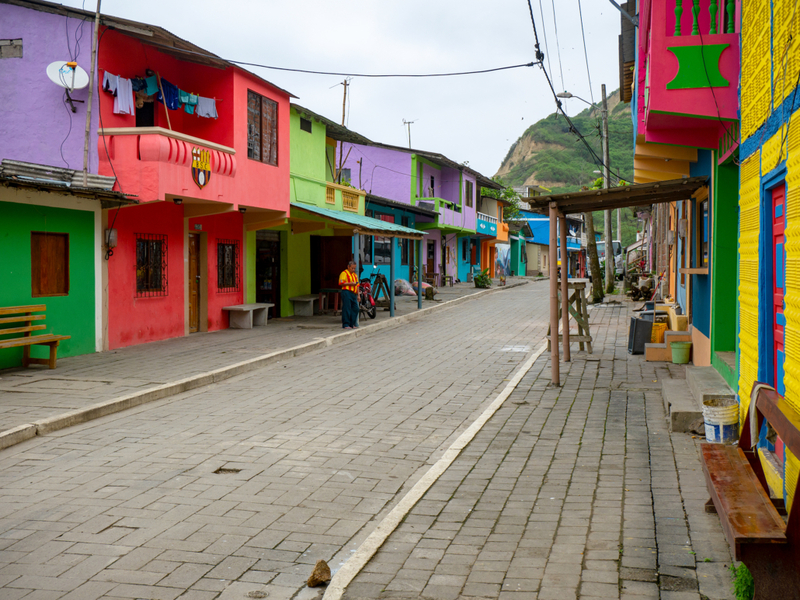 If you travel to Ecuador, we highly recommend staying at Villa de Los Sueños and enjoying the picturesque Ecuadorian comuna of La Entrada. 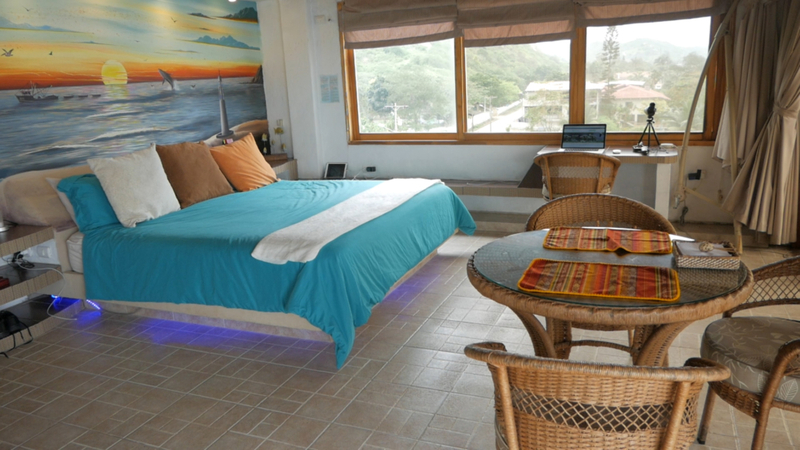 Villa de Los Sueños in La Entrada, Ecuador is a charming B&B with several rooms, a penthouse apartment (where we stayed) and a casita (small house). This is the scene that greets you when you enter the front gate. It’s a tropical paradise! 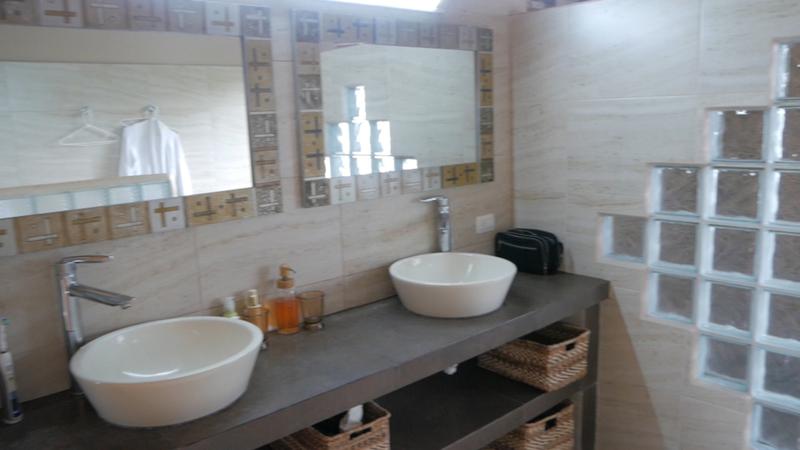 It also has a beautiful pool, hot tub and recreation area, with easy access to the beach for long walks along the 8 kilometers to the south toward Olón, Ecuador. 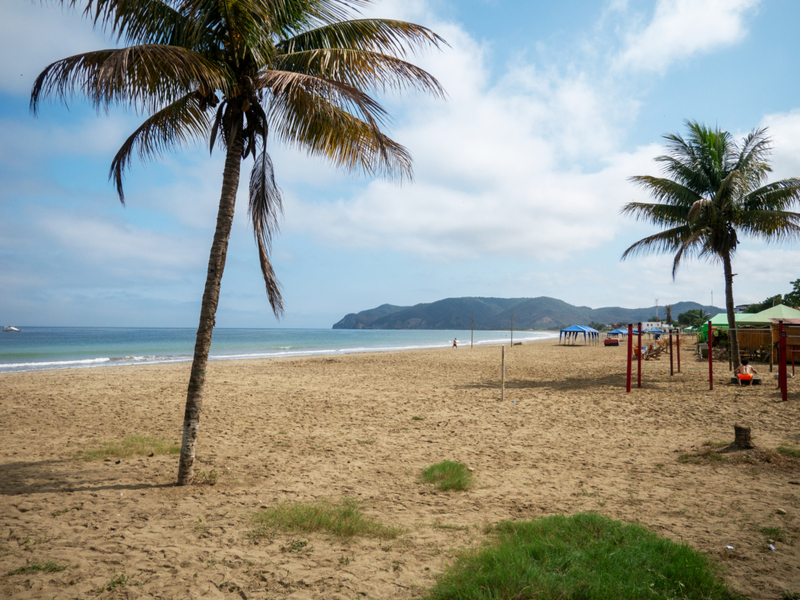 While the beach directly in front of Villa de Los Sueños is rocky, it’s only a short walk south to a beautiful flat beach with lots of waves perfect for boogie boarding. We thought the rock formations were beautiful and gave a distinctive look to views from our apartment. 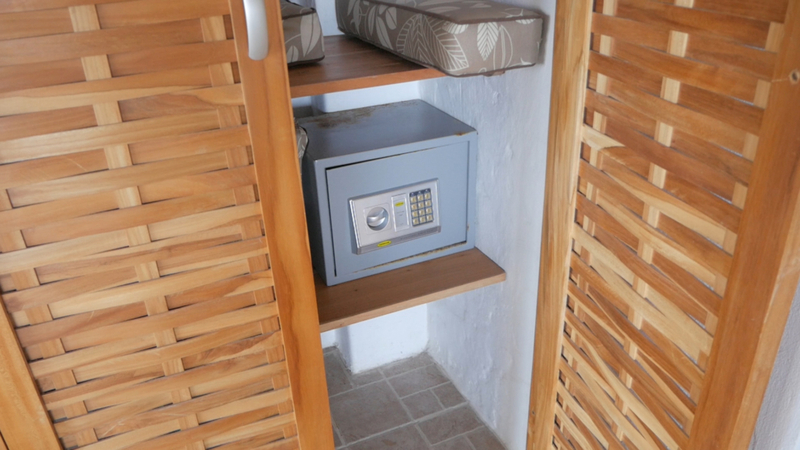 This is the casita, or small house on the property that’s also available to rent. 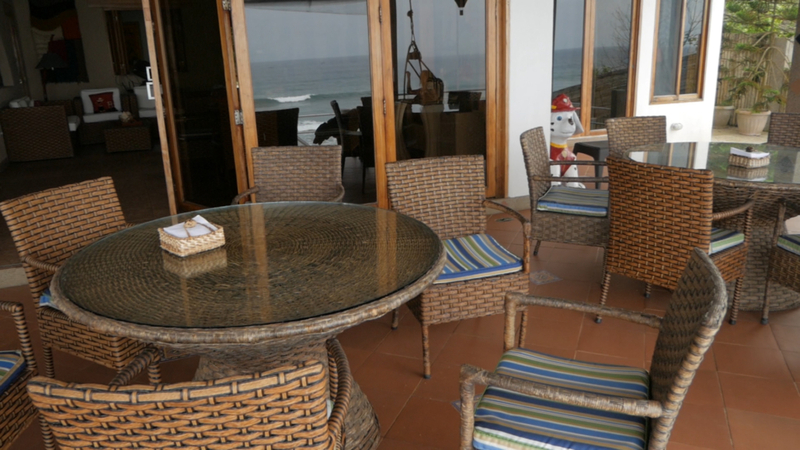 The breakfast area has a beautiful view of the ocean and beach in front of Villa de Los Sueños. The guests gather here around 8:30 AM for fresh fruit, oats, juice, coffee and breakfast made to order. You can eat both vegan and non-vegan breakfast items. We ate raw rolled oats topped with fresh fruit. The first few days, they didn’t have non-dairy milk so we put fresh squeezed orange juice on our oats. I got that idea from Dr. Esselstyn’s book, Prevent & Reverse Heart Disease. It’s a great vegan hack when non-dairy milk isn’t available for your oats. 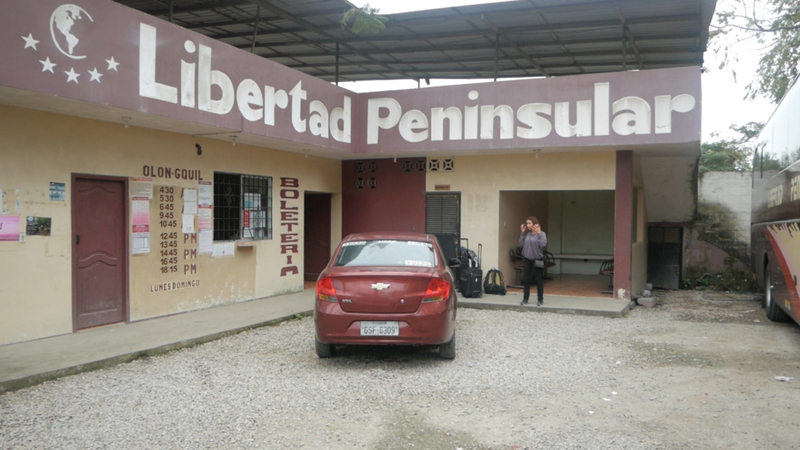 However, Shell bought us some almond milk on his trip to La Libertad to get a new hot water heater (calefon). That was so thoughtful and unexpected! 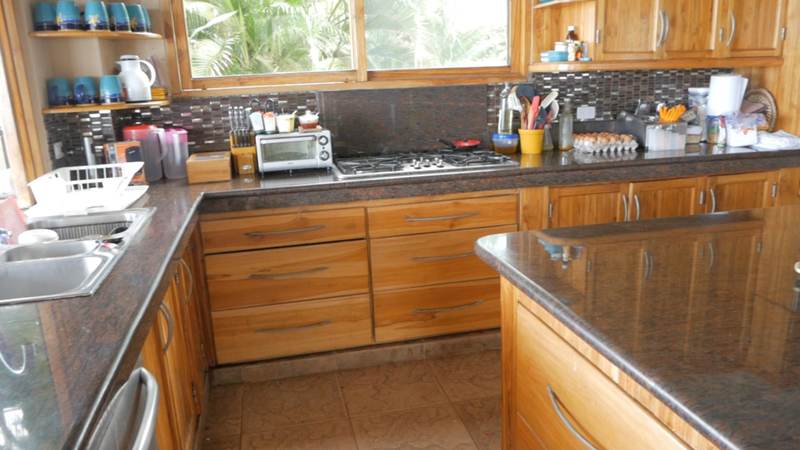 This is the breakfast bar where they line up all the breakfast foods in the morning. 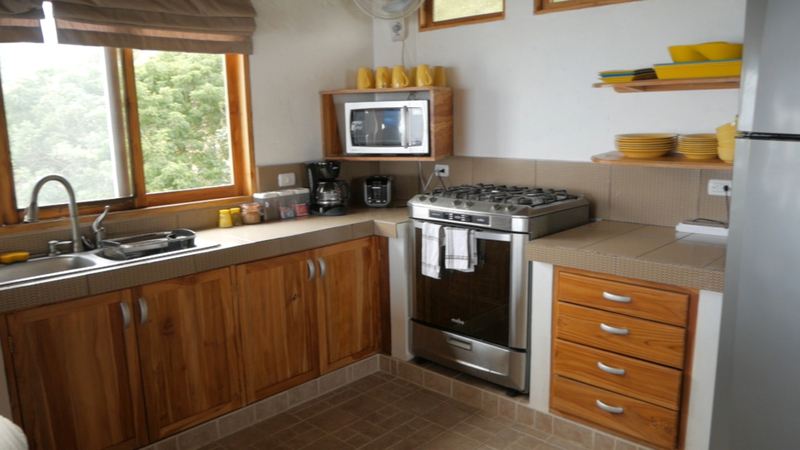 This is the main floor kitchen used by the owners and their employees to prepare breakfast and sometimes dinner for the guests. Choco is the gentle giant Chocolate Lab who performs his own duties as official greeter, security guard and activities director. He loves to go for long walks on the beach to play rock. He gathers up as many rocks as he can fit in his mouth and brings them back home. He has quite the rock fetish! We’re animal lovers so it was nice to have a such a sweet dog to take us on walks and hang out with us in our apartment. 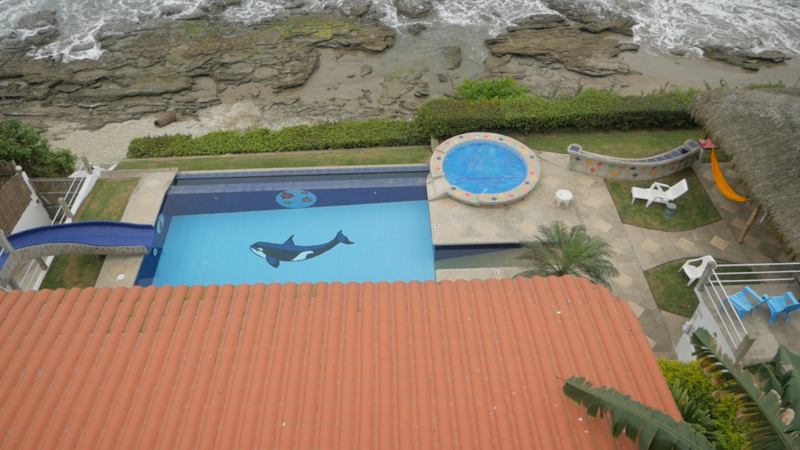 This was the southern view from our penthouse apartment at Villa de Los Sueños. 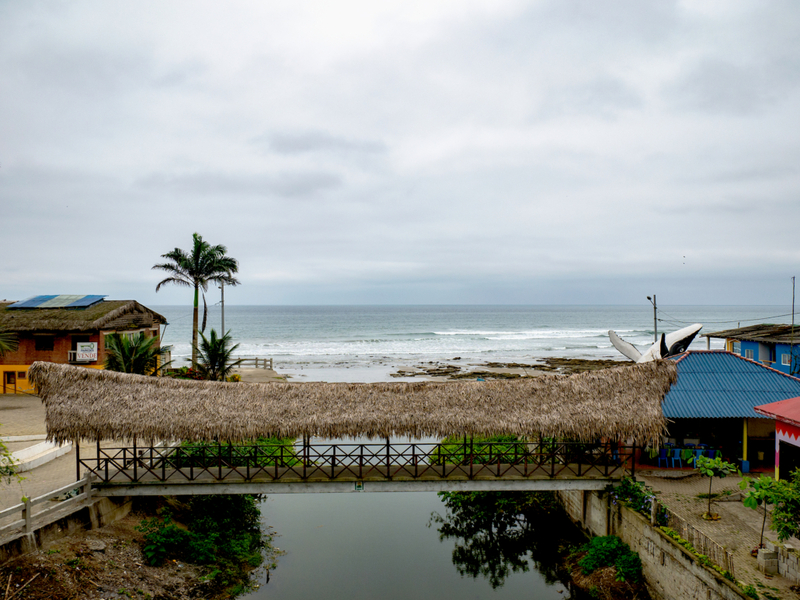 We visited Ecuador’s Southern Coast in late August during the winter season so it was cloudy on most days as you’ll see in our videos, but the sun came out on one of our last days there and completely changed the look and feel of the area. 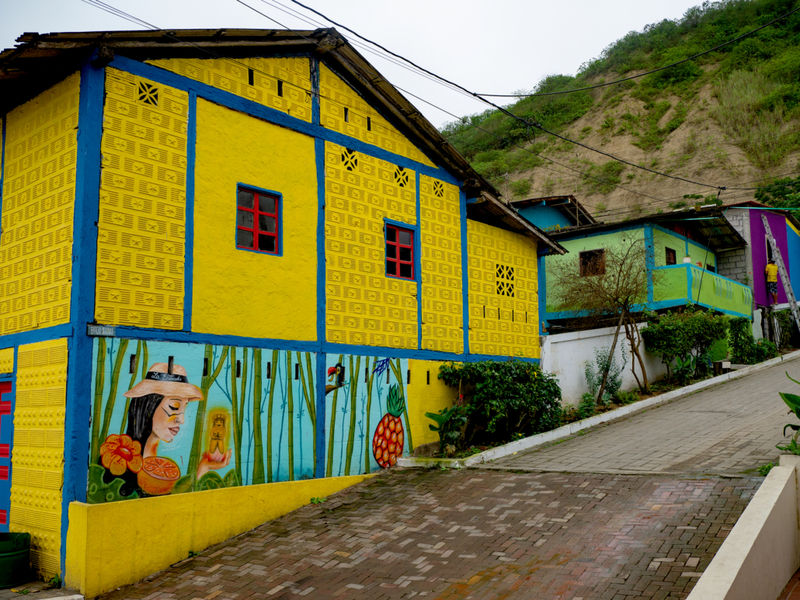 This was the northern view from our apartment showing La Entrada, Ecuador with the church and it’s colorful buildings. 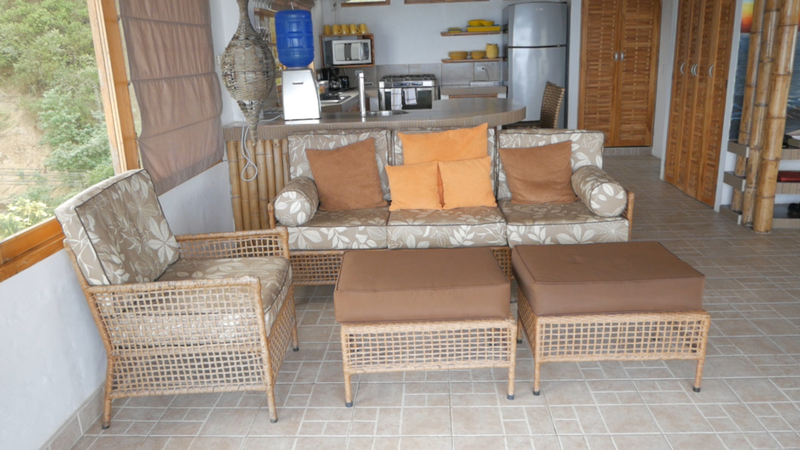 Here are several pics of our penthouse apartment. You can see the full tour in the video. 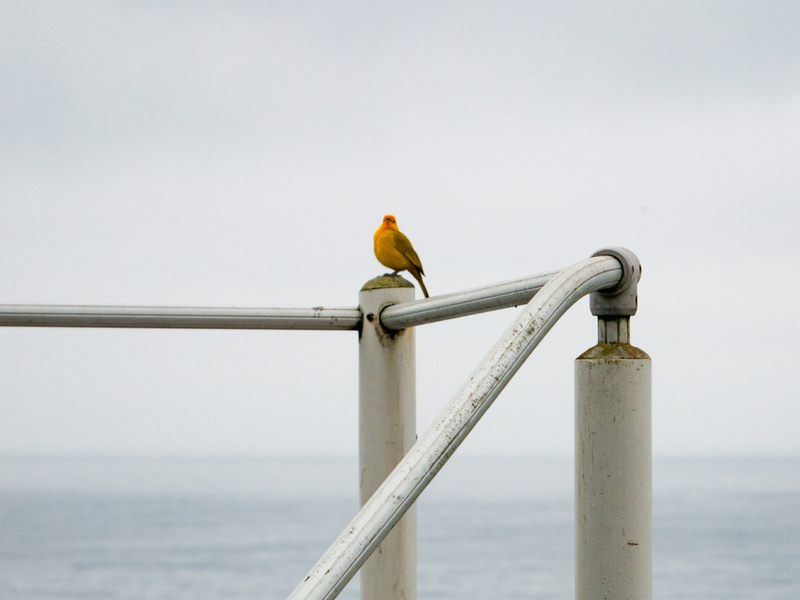 We heard these beautiful birds more than we saw them. But one morning we woke up to his beautiful song. He was kind enough to sit there and sing until I got my camera and captured some video and a few pics. We even saw whales breaching and playing from our balcony. On our last morning we saw a pod of orcas swimming north a few hundred yards off the beach. 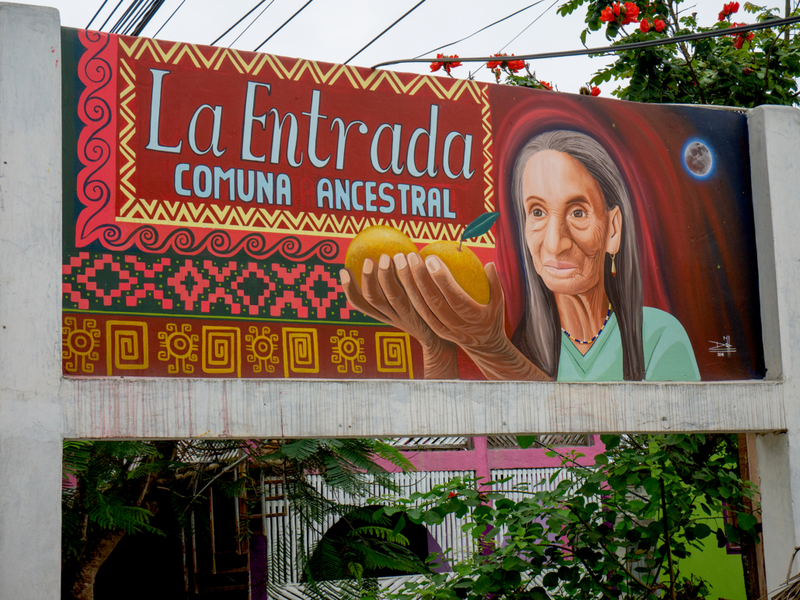 La Entrada is a Comuna Ancestral (Ancestral Community). 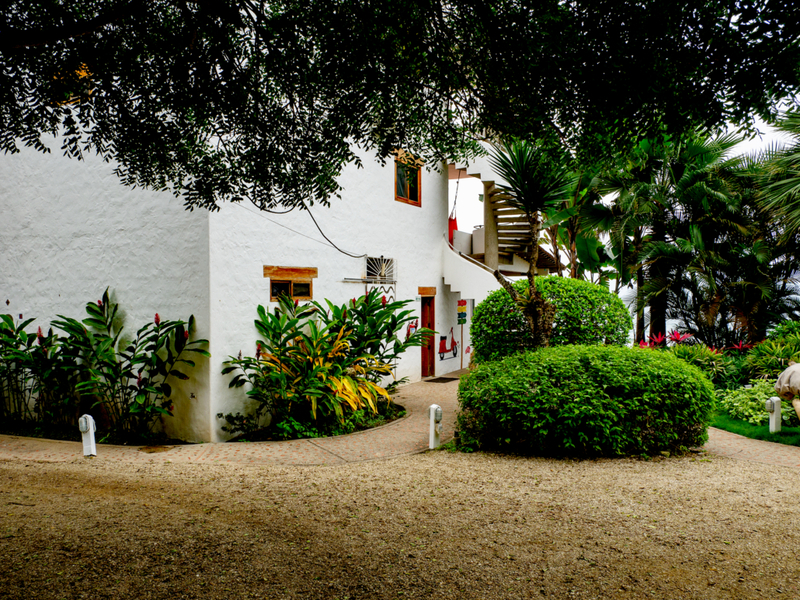 Our walking tour of La Entrada shown in the video shows a typical life in this quaint little pueblita. There are about 850 people who live in here and the surrounding areas, and they all know each other. The elderly couple who lives in this tiny house didn’t have any children so the rest of the town helps take care of them. In Ecuador, as in most Latin countries, family is very important. Nursing homes and retirement homes aren’t very common here. Instead, the families take care of their elders and they often live in the same multigenerational house as their children and grandchildren. In communities like this one, the neighbors pitch in to help the rare elders who don’t have children and grandchildren to help take care of them. Most of the buildings in La Entrada have been repainted, as you’ll see below, but this is one of the oldest and most visually appealing buildings that hasn’t been touched yet. It’s in a bad state of disrepair so it may need to be torn down, but it makes for great pictures. 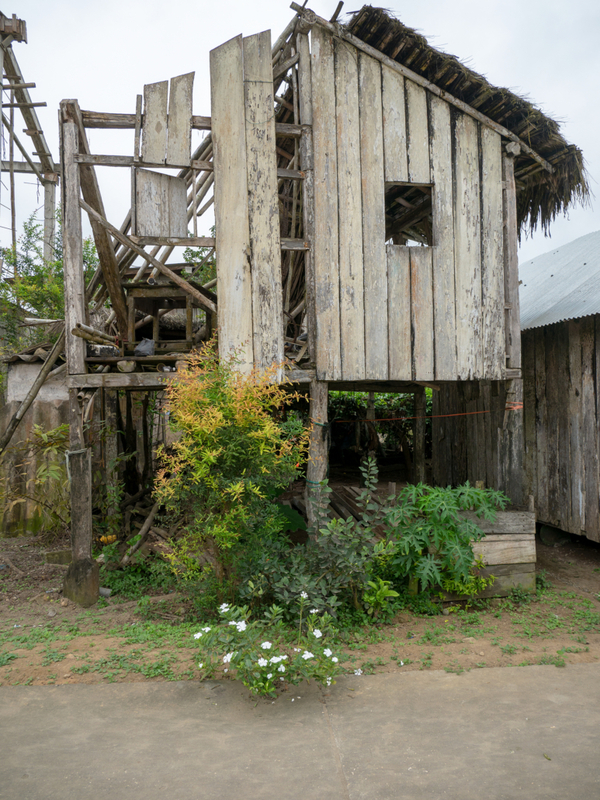 A river bisects La Entrada and this thatch-roofed walking bridge connects the two sides. You can see the whale sculpture peaking out on the right side. This is a fountain/pool that needs to be repaired, but it’s such a cool accent to this beautiful little town. These are small fishing boats used by the local fishers. 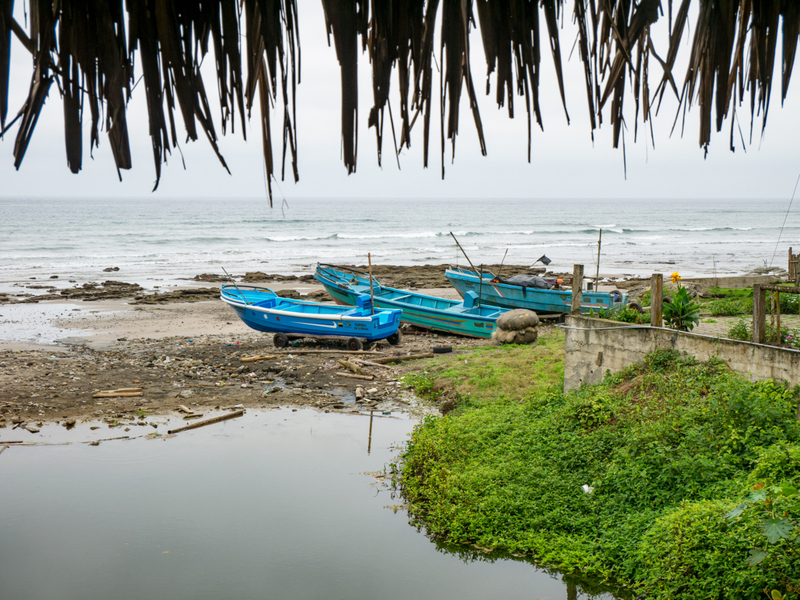 Fishing is a central component, both dietary and economic, for the towns on Ecuador’s Southern Coast. However, as the large industrialized fishing corporations strip the oceans of everything living and not living, these small fishers are struggling. Here’s the obligatory vegan message: please stop buying seafood. It’s unhealthy for you, containing more saturated fat than beneficial nutrients, as well as mercury, PCBs, DDT, birth control, drugs and every other contaminate with which we’ve polluted our one and only home. Chemicals get absorbed into the fatty tissues of fish and can cause cancer and neurological diseases when you eat them. At the current rate of fishing, the oceans are predicted to be nearly fish-free by 2048. That’s only 20 years from now. If the oceans die, we die. Please don’t contribute to the downfall of humanity. These guys were playing a game with marbles that I believe they called ganica. They were having lots of fun and seemed to think us gringos were pretty funny walking around with a strange looking camera taking video and pictures of them. This guy was chopping up coconuts when we walked by. He has a little fruit stand with lots of coconuts and bananas. He was very excited that we wanted to take his picture and record him chopping coconuts. 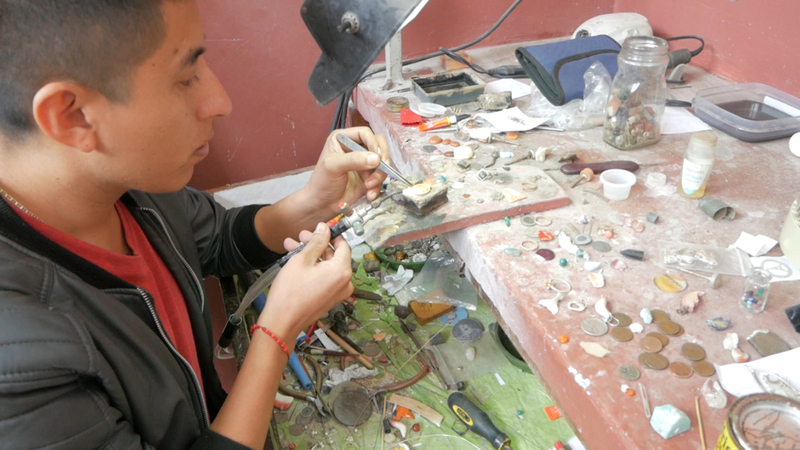 We stopped in the jewelry shop and were able to watch the jeweler making anillos (rings). La Entrada is quite the artistic community. 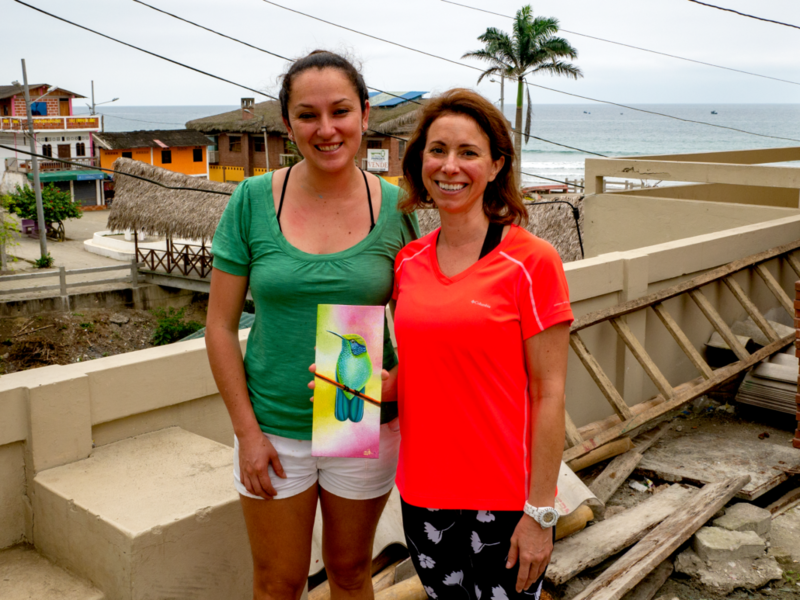 We had just purchased this hummingbird painting from the art gallery when we ran into the artist on our way back to the Villa de Los Sueños. She was happy to pose for a picture with the newest member of Amelia’s hummingbird collection (she also has earrings and a new hummingbird tattoo shown in a future video). 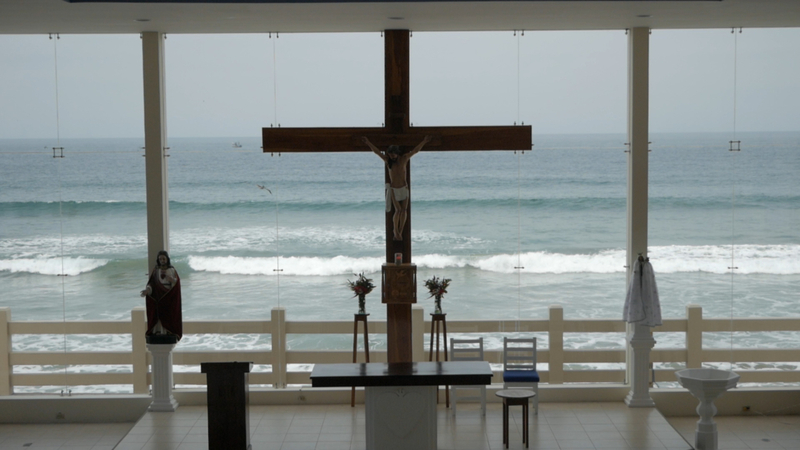 La Entrada has a new church that would be perfect for destination weddings. One of the local townspeople told us they’ve already had a few there this year, and it’s easy to see why. Can you imagine getting married with that view behind you?! Again, Shell and Marsha are largely responsible for that amazing view. The architect wanted to make it a solid opaque wall! Why? Just why? After some heated discussions, they convinced the architect to make it a glass wall and he agreed as long as the town could come up with the extra funds to pay for it, which they did. This beautiful church, along with the colorful buildings and murals, has put La Entrada on the tourist map, which is bringing more gringos and their money to the community, raising the standard of living for everyone there. This cute little guy was happy to pose for me. He was playing with that little black rock. Balls aren’t common here, so we saw lots of dogs playing with rocks, just like Choco did. 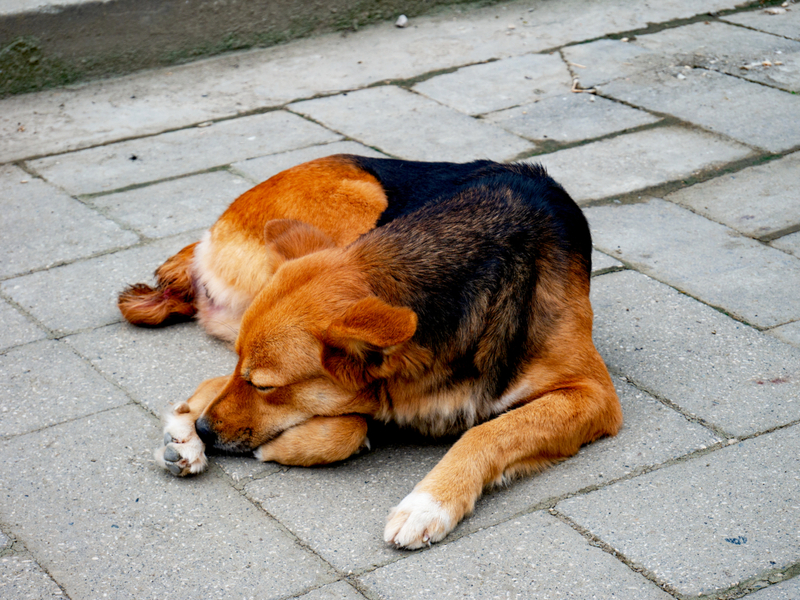 This beautiful dog was sleeping on the street. While some people treat their dogs like we do back in the States, a lot of dogs roam freely and everyone seems to take care of them. Some have homes, but are allowed to hang out with their friends, go for a walk and find food during the day and then return home at night. 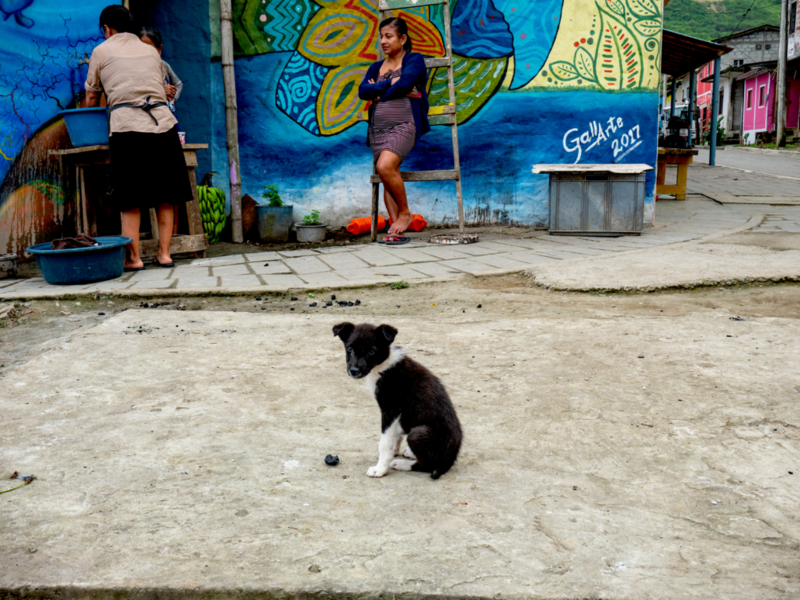 Dogs are a lot like people here in Ecuador, with a lot of freedom to do what the want. We noticed several overly skinny dogs and thought they weren’t being fed, but that’s apparently not the case. 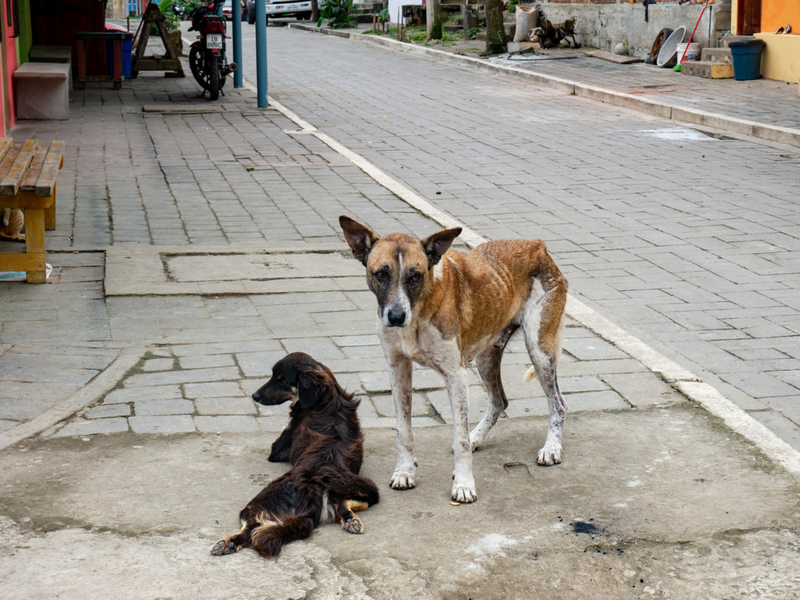 We were told that these dogs have a tick disease that’s very expensive to treat. 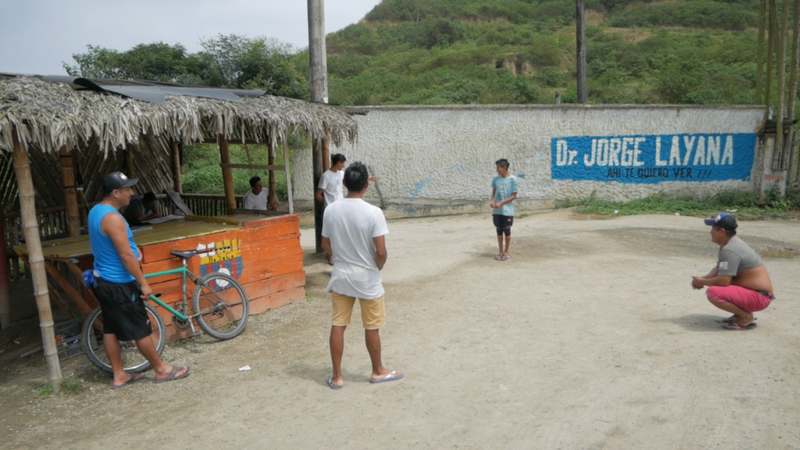 It takes a multi-day course of antibiotics that aren’t easy to come by in this rural comuna. 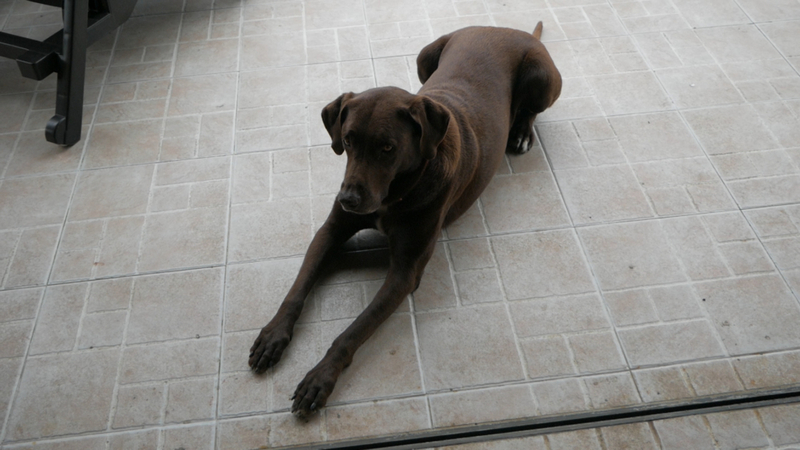 Choco came down with this disease when he was a puppy and required 3 days of IV antibiotics. Eggs are popular here, and so are roosters. 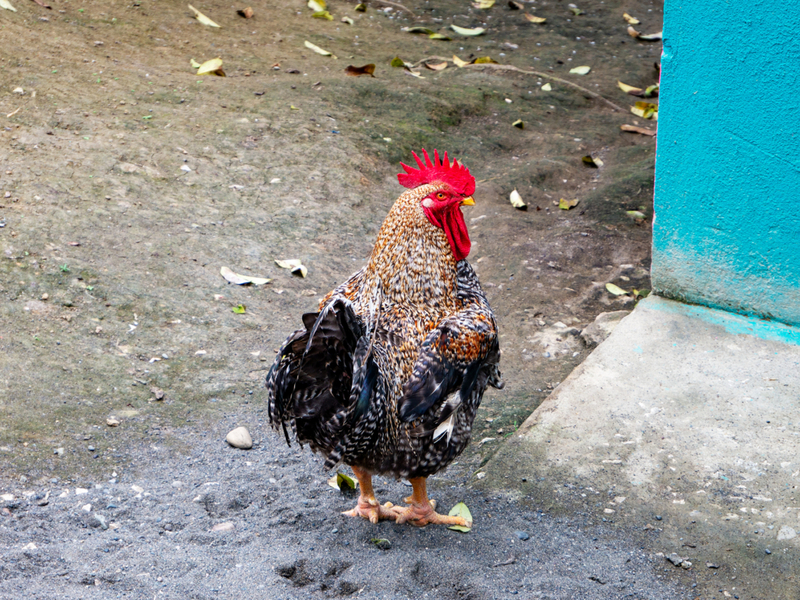 We saw several egg laying hens and roosters roaming freely, along with the dogs and even a few cats. Life here is like travelling into the past to see how humans used to coexist with domesticated animals before we started imprisoning them in dark, cramped, disease infested factory farms. 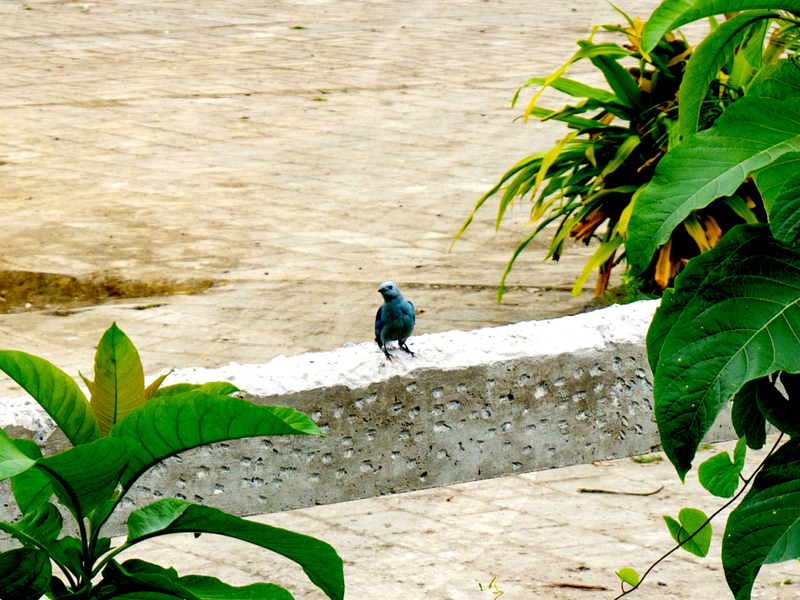 This beautiful blue bird posed for a few pictures. His mate was eating something up in the green foliage to the right of this photo. 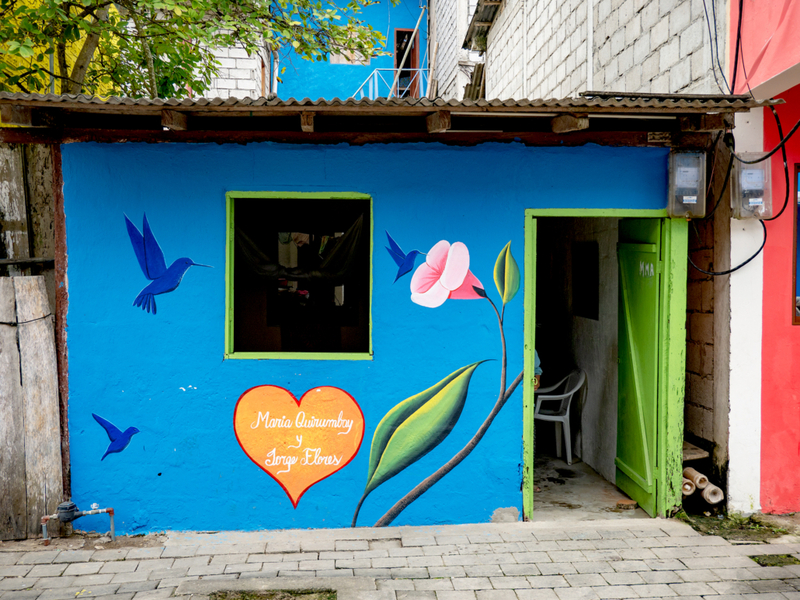 Shell from Villa de Los Sueños has been integral in leading the effort to update the town’s appearance. 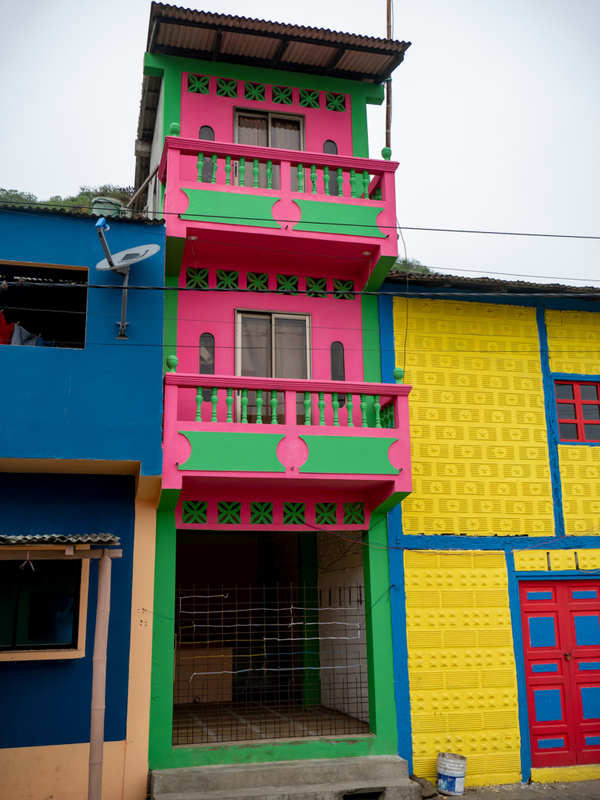 It was his idea to paint each building a different combination of 3 bright colors, which is a traditional Latin style. I’m not going to narrate each of these photos so just enjoy the colors. 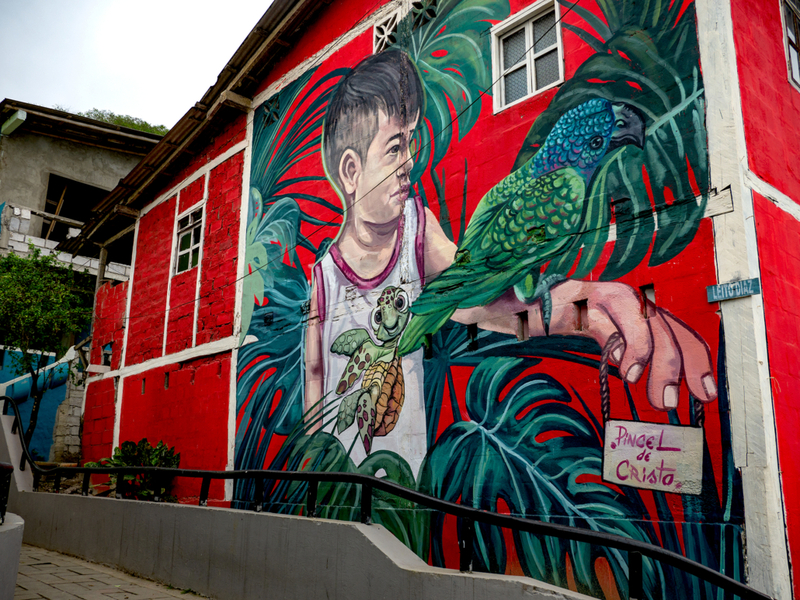 Shell has also been instrumental in having the town painted in beautiful, culturally relevant murals. 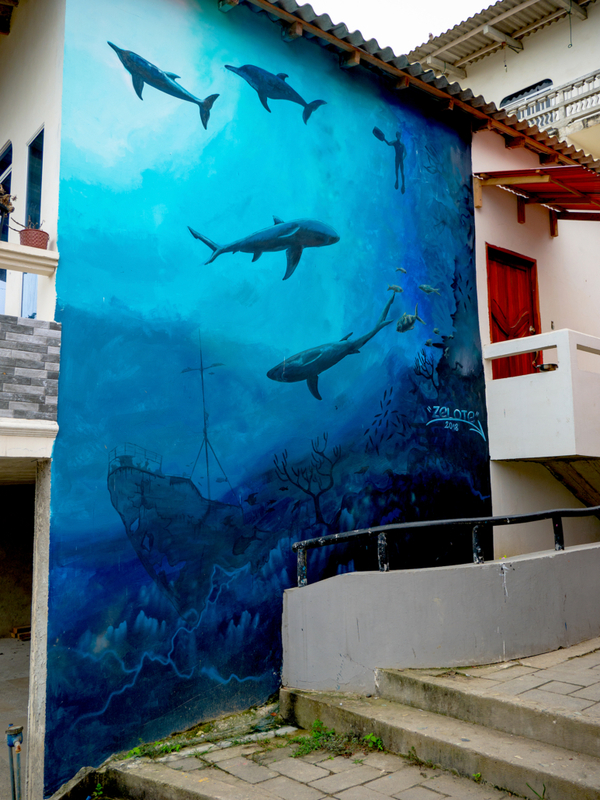 When we visited, we were told that the town currently boasts 26 murals, but the goal is to double that. The artists will be returning this summer to paint even more. 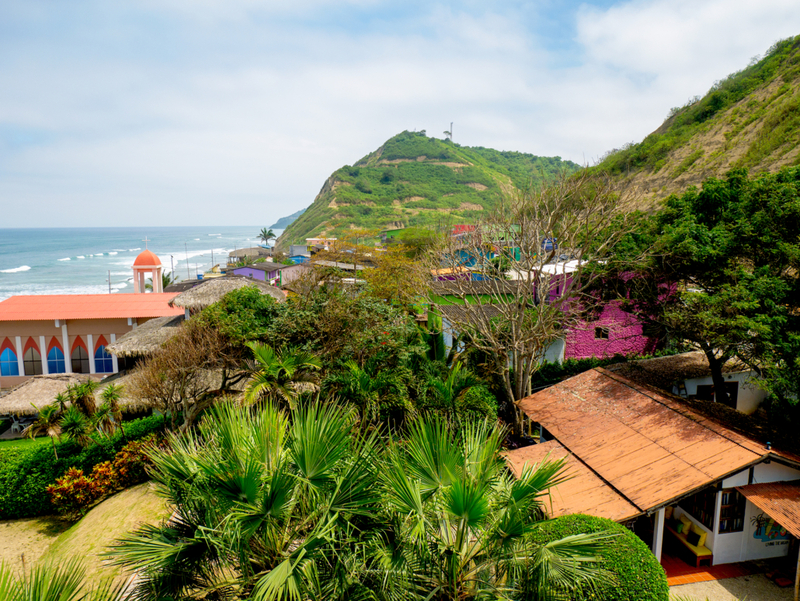 We hope you enjoyed our tour of Villa de Los Sueños and La Entrada, Ecuador in the fourth part of our trip to Ecuador’s Southern Coast. Please remember to like, comment and share our video, and also subscribe to our YouTube channel. If you’d like us to make a video about something specific or if you have questions, please let us know in the comments. 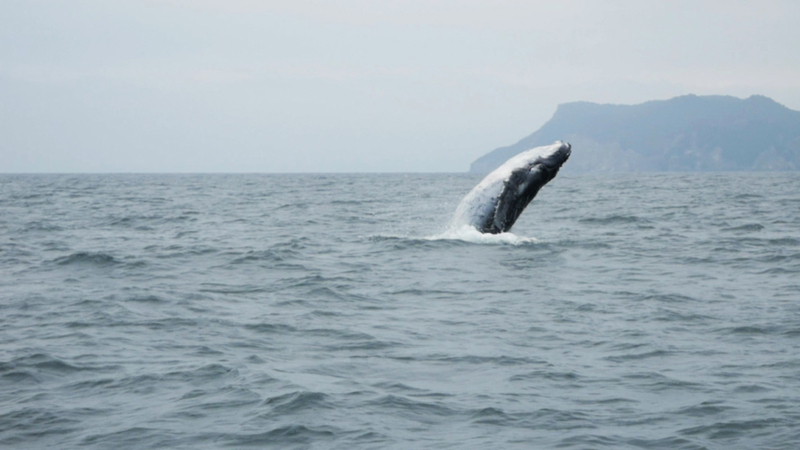 My whole life I’ve dreamed of seeing whales up-close, and our Puerto Lopez Whale Watching tour on Ecuador’s Southern Coast more than delivered! 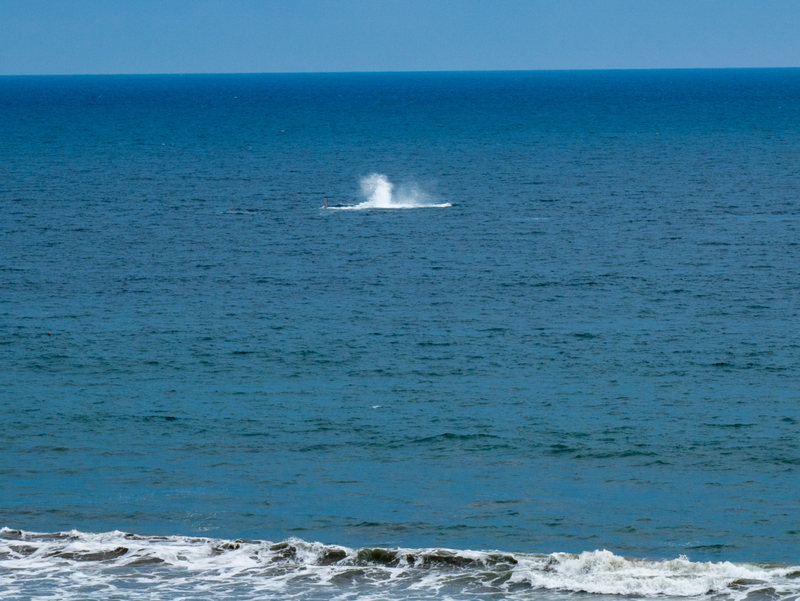 We saw a momma whale and her baby playing pretty close to the port of Puerto Lopez, Ecuador. They swam right by and even under the boat. They’re such amazing, prehistoric looking animals! 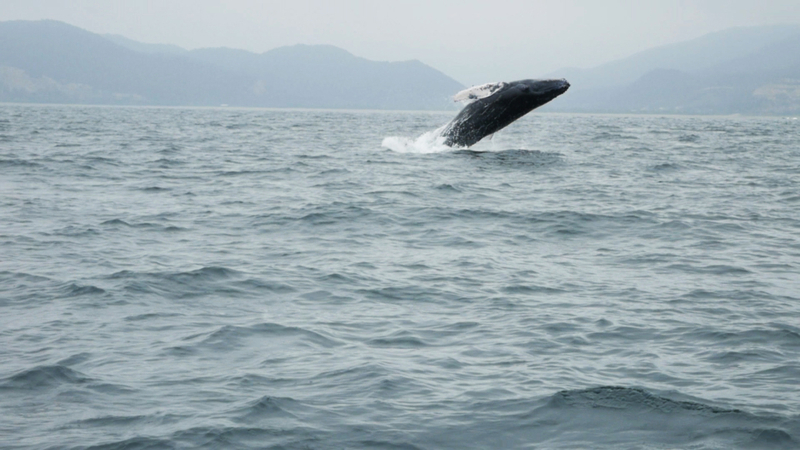 We hope you enjoy seeing the beautiful scenery and humpback whales on our Puerto Lopez Whale Watching tour. 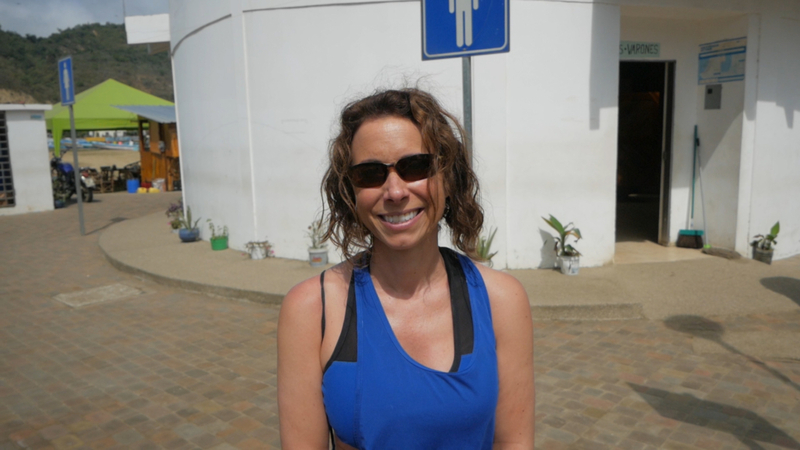 We took a bus from La Entrada to Puerto Lopez to go whale watching. Marsha at Villa de Los Sueños told us to take the bus to the new bus terminal on the north side of Puerto Lopez, but did we listen? Nope. 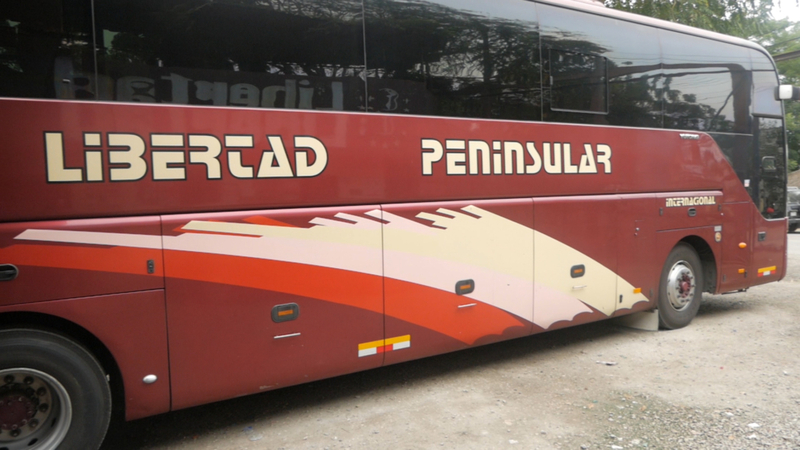 At the first stop on the south side of Puerto Lopez, there’s a tour company that told everyone to get off the bus who’s going whale watching or to Isla de la Plata. Well, that was us, but we already had tickets to go with a different tour company down on the beach. Once we discovered our mistake, the tour guide offered to call us a moto taxi, but he said it was only about a 10 minute walk so we decided to hoof it. 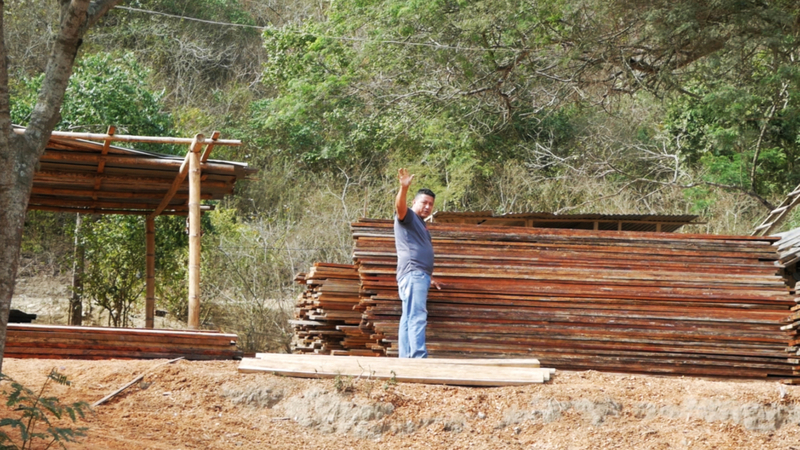 On our walk, we saw this buen caballero (good gentleman) who waved and welcomed us to Puerto Lopez. 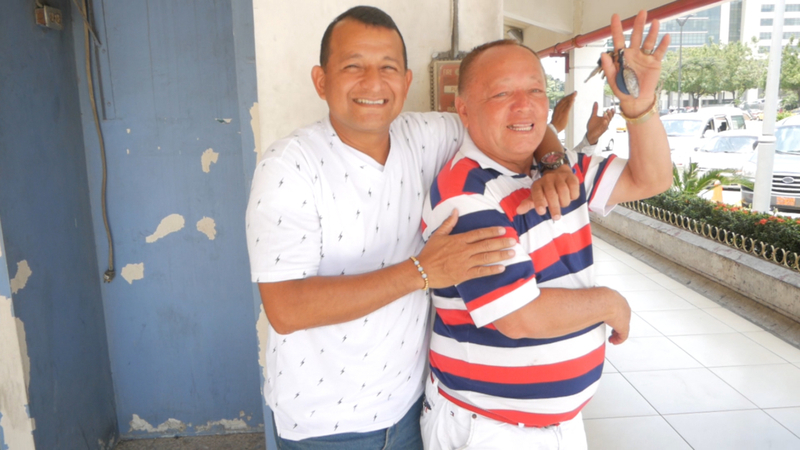 The Ecuadorians are very friendly to us gringos. 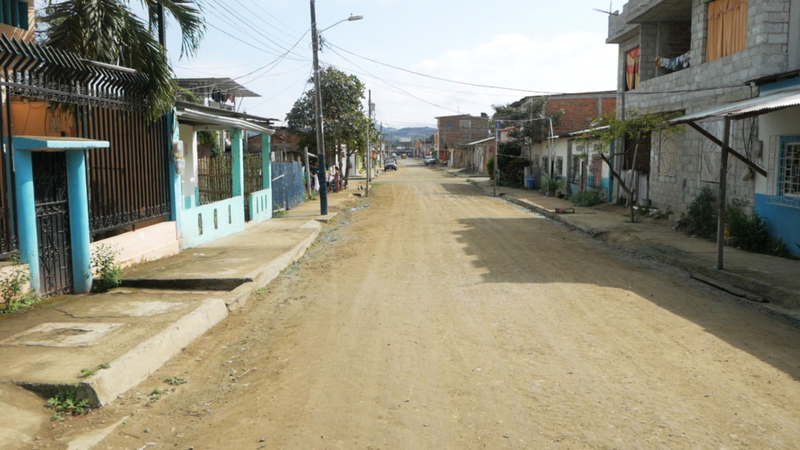 Most of the side streets in Puerto Lopez on our walk from the bus stop to the beach looked like this one. Dirt roads with people working, children in school and street dogs. 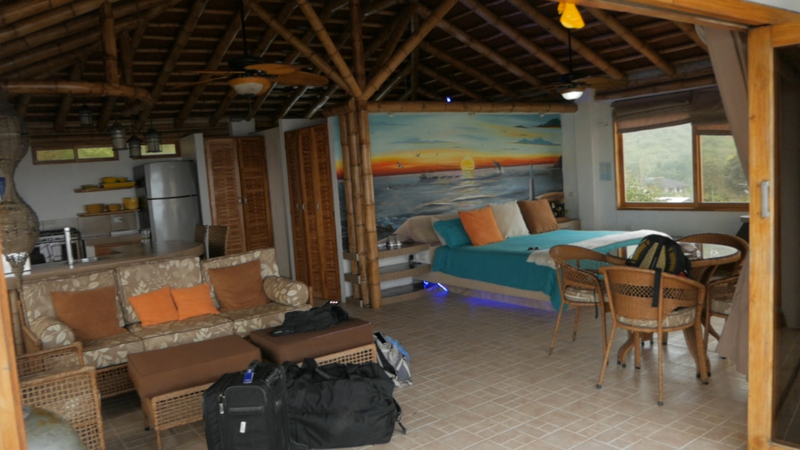 The Puerto Lopez beachfront renovation was recently completed and it’s beautiful. 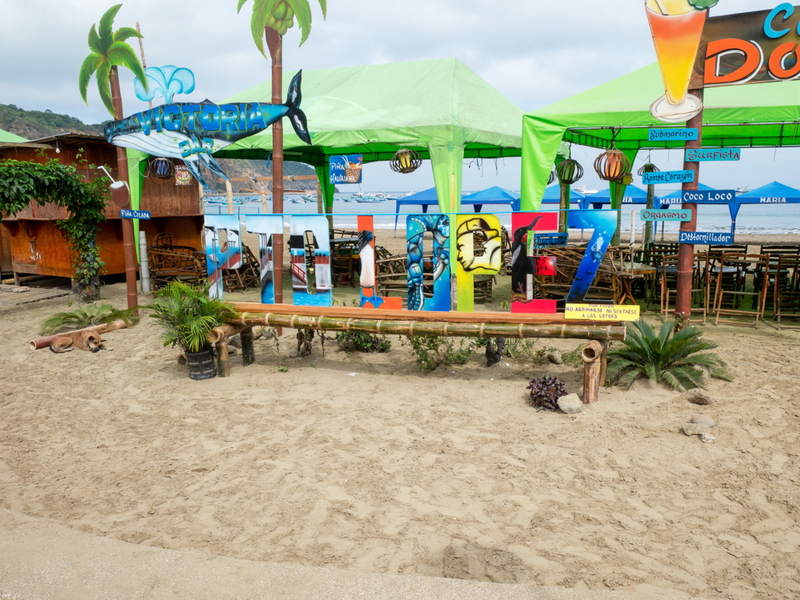 It took over two years, we were told, to tear down all the old beach shacks and replace them with updated structures. The beach was super clean and relatively empty. It was the winter season on our trip, so there weren’t many people there. 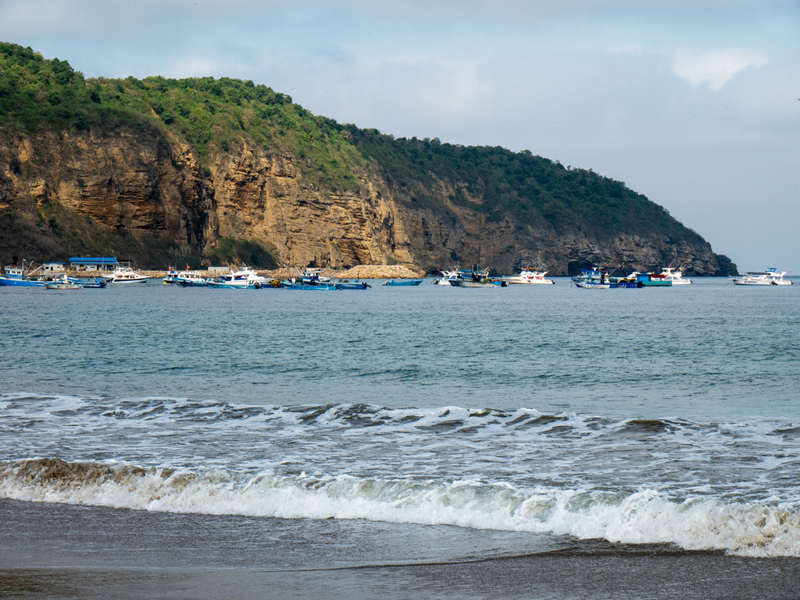 From the beach, you can see all the boats anchored near the port, as well as the beautiful rock formations that melt into the sea. No beach photo is complete without the requisite palm trees, sand and blue ocean background. This picture would make a great puzzle! Notice how clean and seaweed free the beaches are. 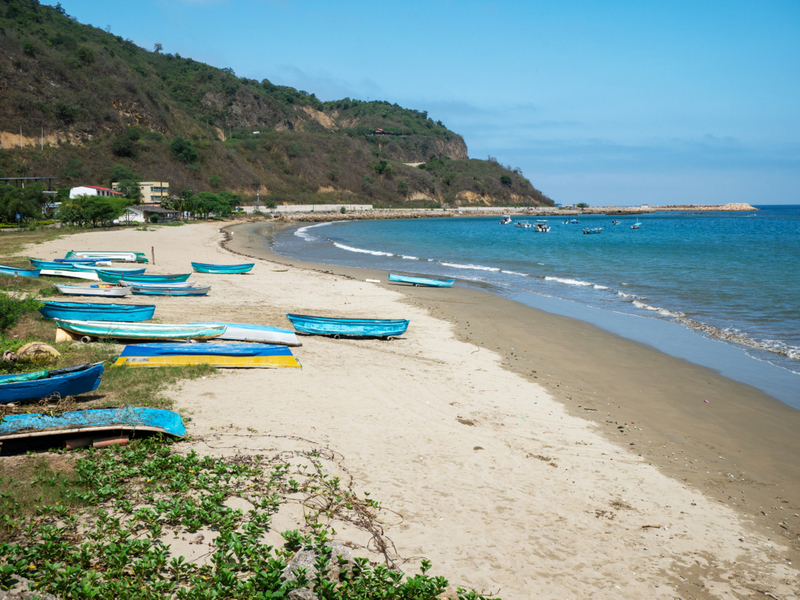 Puerto Lopez has a truly amazing beach. 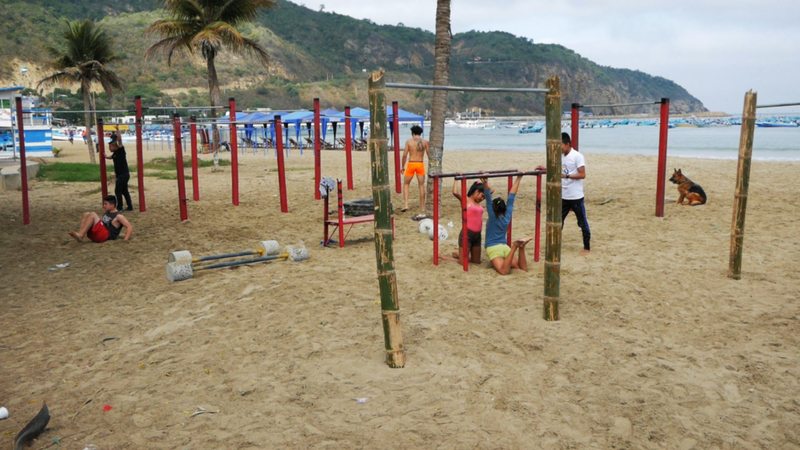 Amelia and I were impressed with the fitness of this group of people working out on the beach. I had serious ab envy for the guy in the orange shorts. Amelia has a slight public restroom phobia, so she’s always excited to find a clean bathroom. 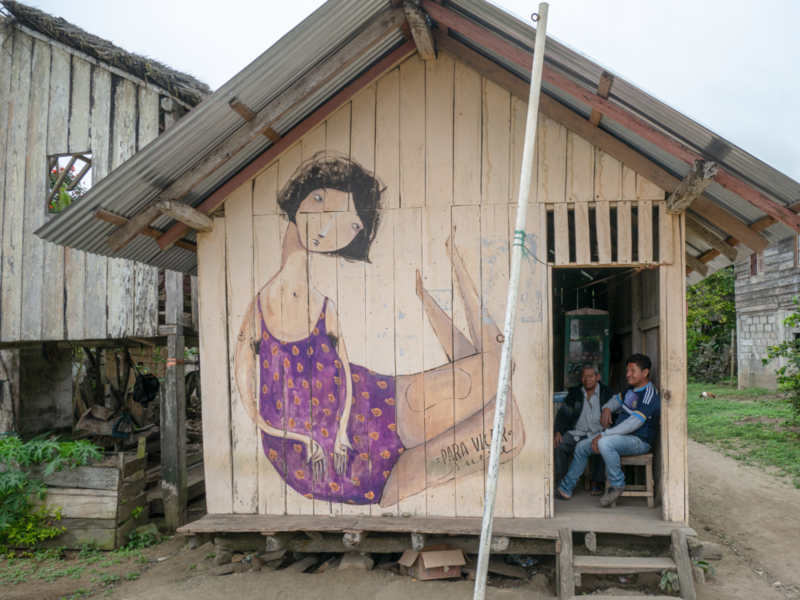 Most of the public restrooms that we’ve seen in Ecuador are private enterprises, or at least public enterprises with a fee. Most cost 25 cents for women, 25 cents for men if you need to use the toilet and require toilet paper, and 10 cents for men’s urinals. That’s a lot of boats! Most of them are small fishing boats. The fishers go out at night and return in the morning to sell the fish they caught in the Puerto Lopez fish market. Here’s the obligatory vegan message: please stop buying seafood. 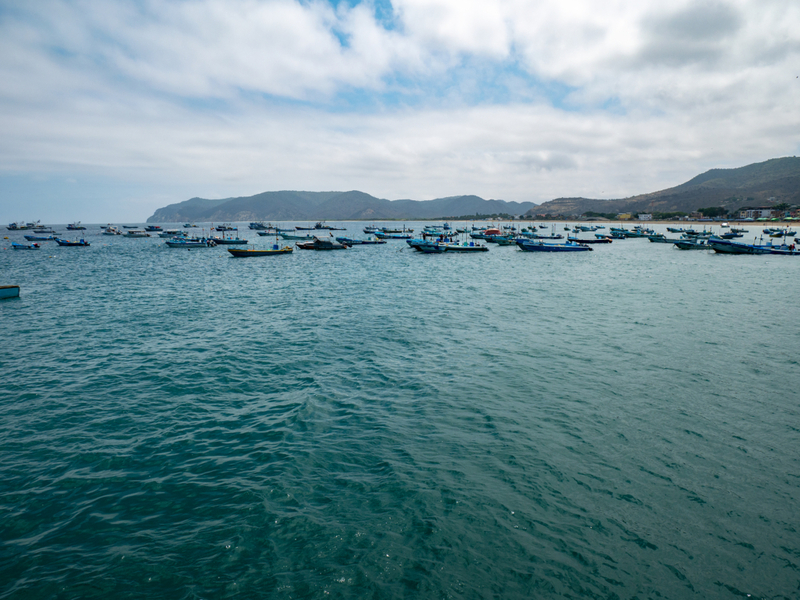 Our oceans are on track to be devoid of fish within the next 20 years, by 2048. If the oceans die. We die. It’s that simple. Do you want to be the generation that brings humanity to its knees? I certainly don’t. That’s why Amelia and I went vegan and stopped supporting the fishing industry. We booked our Puerto Lopez Whale Watching Tour through Marsha at Villa de Los Sueños with a company called Aventuras La Plata. We were the only two people with that particular tour company, so they put us on a boat with another tour company. I’m pretty sure they pool their passengers to make the most money. Coopetition is a smart way to do business. 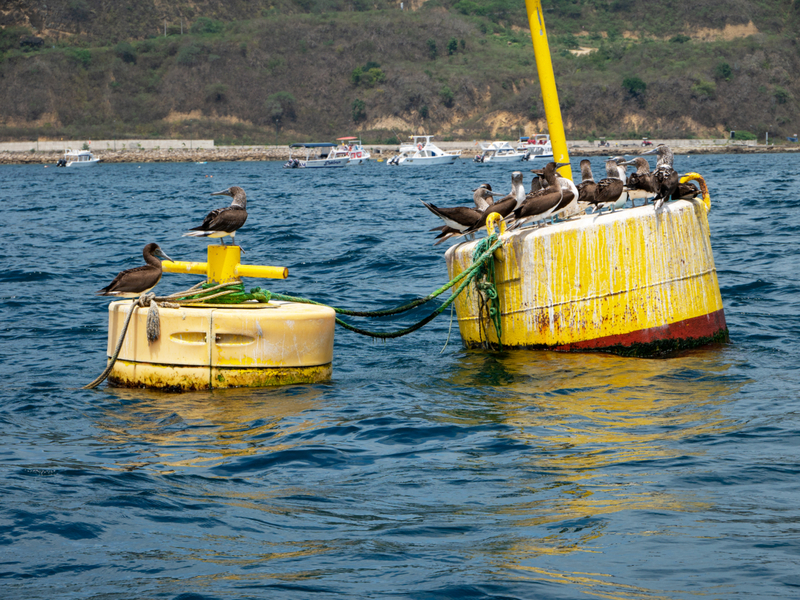 These are Blue-footed Boobies that we saw perched on a buoy shortly after we left the doc to go whale watching. Males use their bright blue feet to attract mates with an elaborate dance, but they’re also quite vocal about it. Amelia was obsessed with seeing the boobies (hehe) so I’m glad we saw some without taking the much longer Isla de la Plata tour, the location of their mating grounds. 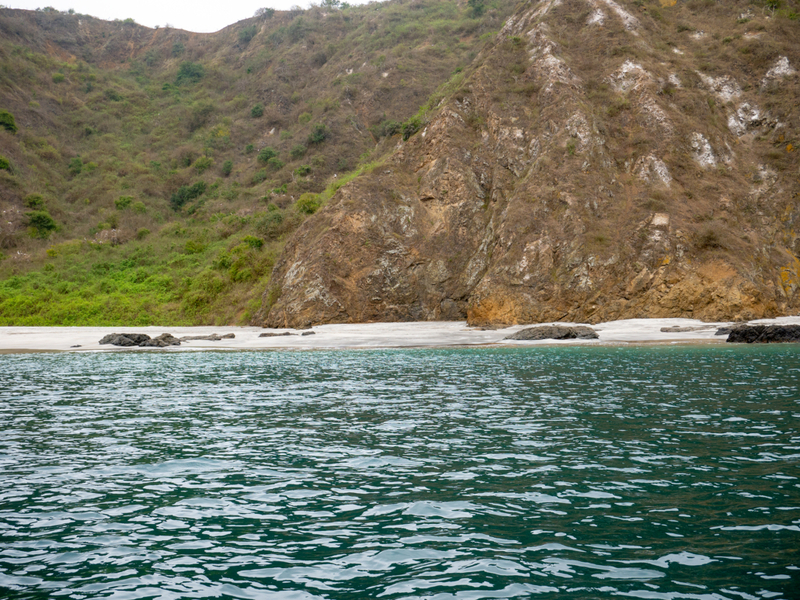 Our Puerto Lopez whale watching tour did NOT disappoint! The guide prepared us all before we left the dock to be patient. It could take awhile to find whales and patiences was our best friend. Within 10 minutes of leaving the dock, we spotted this baby Humpback Whale and its mom playing within sight of the Puerto Lopez beach! The captain kept the boat at a safe distance, but the whales swam right up to us. 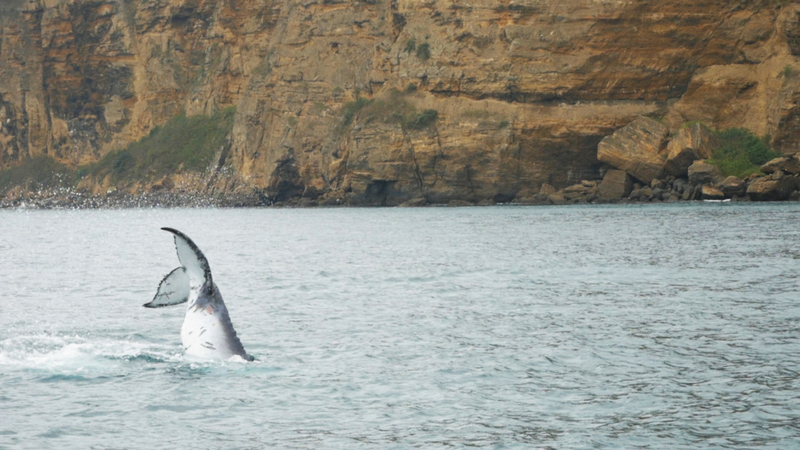 This baby whale flapped its tail as if he was saying hello, just a few meters from the boat. You can see mom in front and the baby behind her in this photo. Humpback Whales are amazing, prehistoric looking animals. Mom and baby finally stopped playing and the passengers on the boat started getting restless so the guide took us to the next part of the tour: snorkeling on a small island beach about 30 minutes from Puerto Lopez. It was overcast and chilly by the time we got there so Amelia and I stayed on the boat while most of the other passengers got in the water for the fastest snorkeling trip known to man. It took them longer to put on their suits than it took them to get in and out of the water! I’m glad we opted to stay warm and dry on the boat. On our way back to Puerto Lopez from the snorkeling beach, we saw another pod of Humpback Whales. 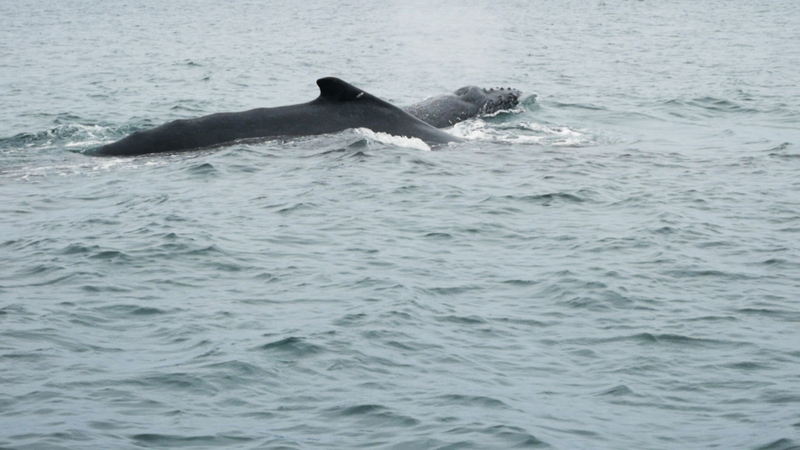 We were really lucky to see two different sets of whales on our Puerto Lopez Whale Watching tour! This humpback was still a juvenile, but quite a bit larger than the baby we saw breaching shortly after leaving the dock. 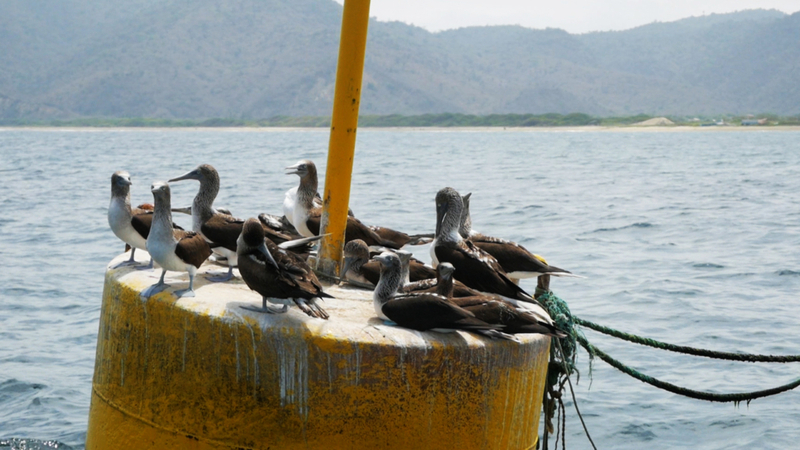 We loved our whale watching tour in Puerto Lopez! It was a lifelong dream of mine to see whales up-close like this, and it was more exciting than I imagined! 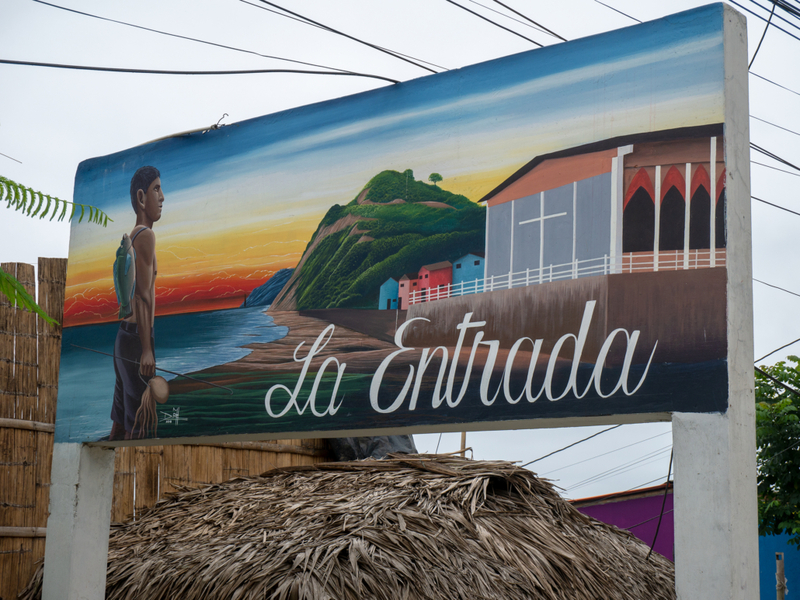 After a little time on the beach enjoying a cerveza, a nap and the soothing sounds of crashing waves, we decided to head back to La Entrada from Puerto Lopez. About a third of the way there, our bus started making a loud noise. The bus driver and the money collector got off and banged on something under the bus for about 10 minutes before getting back on the bus and driving a ways further. The noise got louder and we could literally feel something banging under the floor of the bus. I’m pretty sure the transmission was shot. The driver stopped again and banged some more before driving off again. By this time we were on top of the mountain pass between Puerto Lopez and La Entrada so we were a bit concerned about going down the other side with a faulty transmission. However, the driver left the bus in low gear and we slowly descended down to La Entrada and were more than happy to get off after more than an hour on the bus. 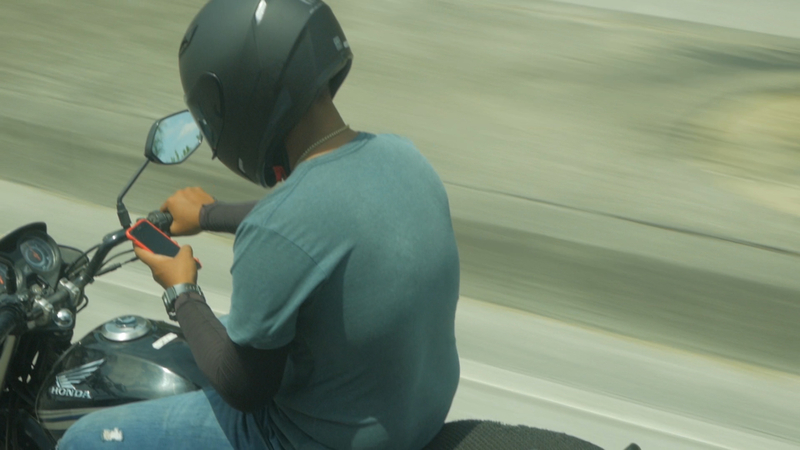 (the ride to Puerto Lopez from La Entrada took less than 40 minutes). We hope you enjoyed our Puerto Lopez Whale Watching tour in the third part of our trip to Ecuador’s Southern Coast. Please remember to like, comment and share our video, and also subscribe to our YouTube channel. If you’d like us to make a video about something specific or if you have questions, please let us know in the comments. 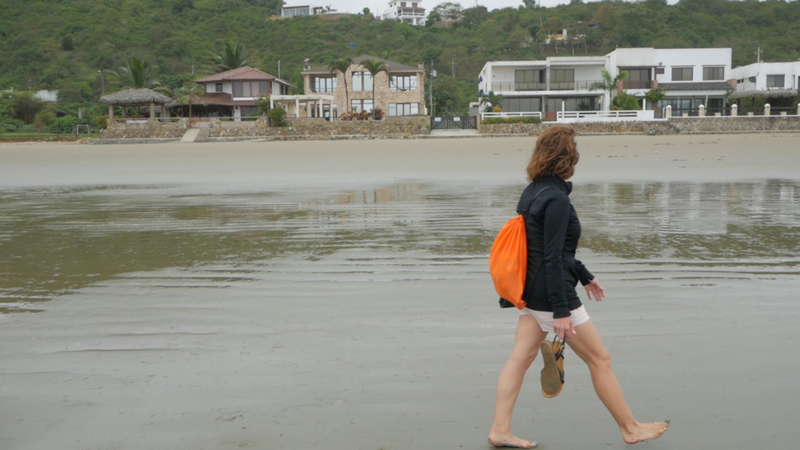 It was an overcast morning, but it was warm (in the mid-70’s) and didn’t look like rain so we decided to walk along the beach 8 kilometers from La Entrada to Olón and Montañita, Ecuador. 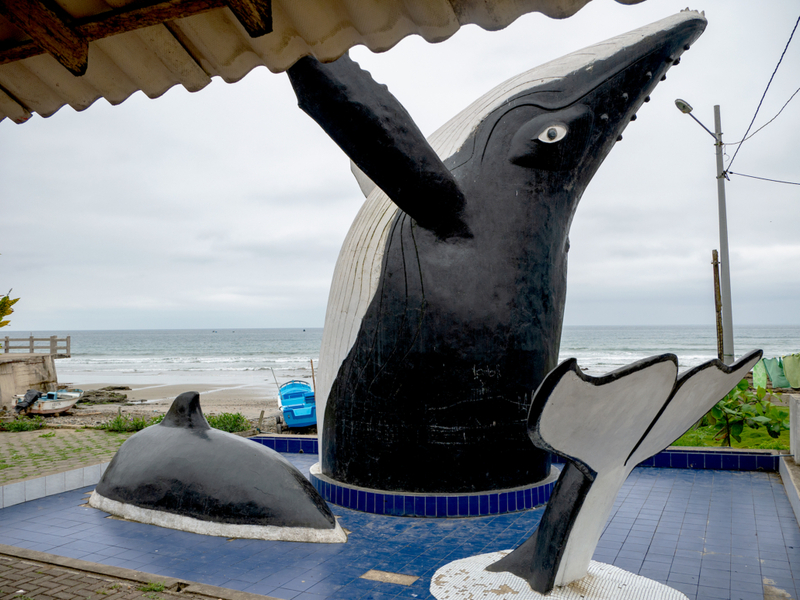 The beach was virtually empty all the way to Olón, except for a giant whale! 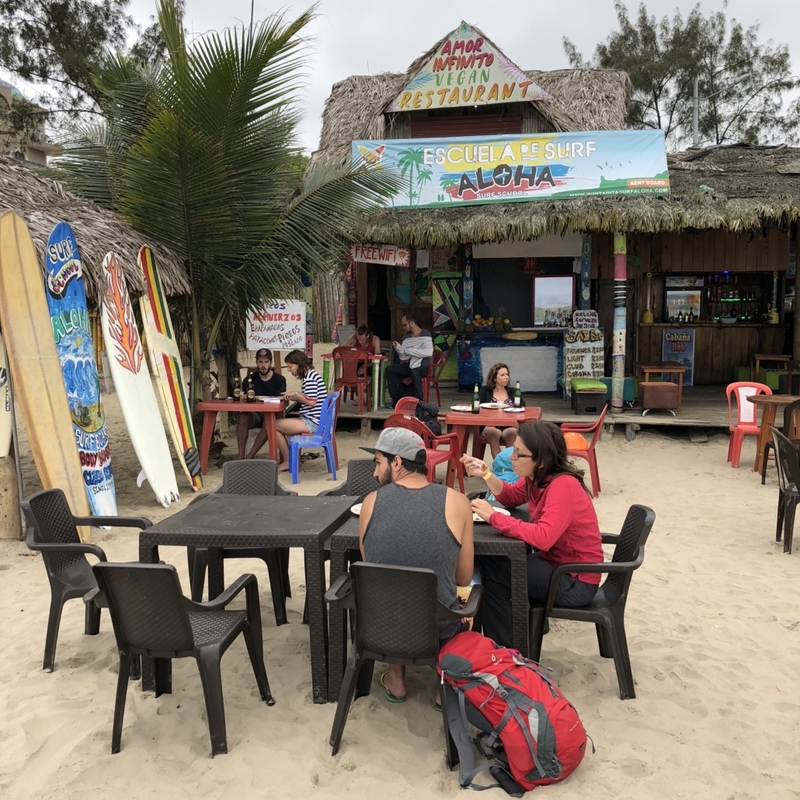 We hope you enjoy seeing the beautiful scenery, the vegan beachfront restaurant, and the other interesting things we see in Olón and Montañita, Ecuador. 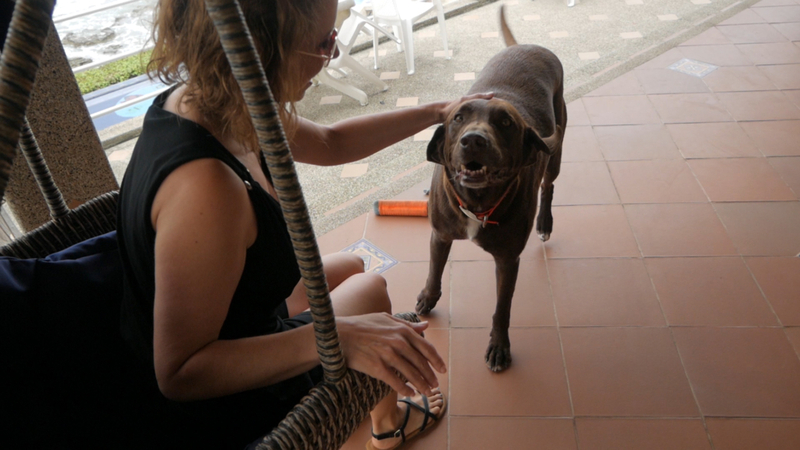 Choco is the resident greeter, security guard and activities director at Villa de Los Sueños, the B&B where we stayed on Ecuador’s Southern Coast. Most mornings, we went for a walk on the beach toward Olón and Choco joined us to play rock. Choco loved chasing the rocks that I threw for him. He tried to fit all of them in his mouth, every rock I threw on our walk, and then he brought them back to the B&B. There were little piles of rocks all over the grounds, and even one on our 4th floor balcony. He has quite the rock fetish! 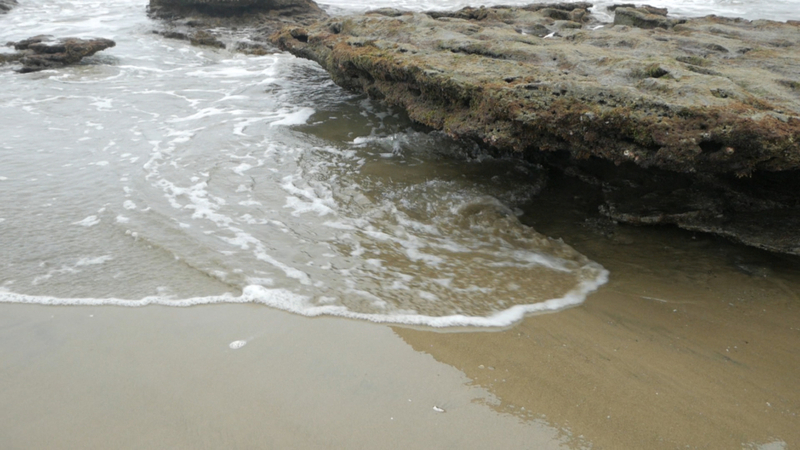 The beach in front of the B&B and La Entrada has lots of interesting rock formations. It’s not nearly as sandy as the rest of the beaches in the area, but it is beautiful to look at and to watch the waves crashing against them. Like most beaches in the world today, there was quite a lot of small pieces of plastic on this stretch of beach that needs to be picked up. Amelia is in heaven. We went to the coast during Ecuador’s winter season so Cuenca at 8,000 feet had been quite chilly for the previous couple of months. Even though it was overcast, she was very happy to be warm. 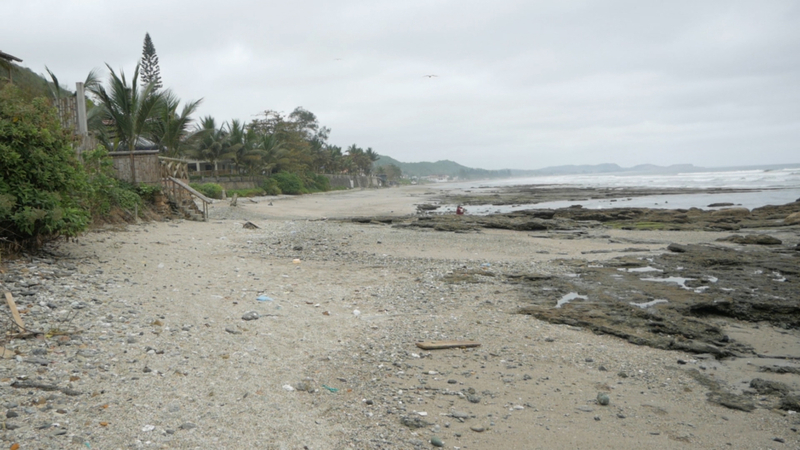 Most of the beaches on Ecuador’s Southern Coast look like this. They’re extremely flat and wide when the tide is out, but they almost completely disappear when the tide is in. The B&B had a tide clock in the dining room area so we knew when it was safe to walk on the beach. The tide comes in rapidly and you wouldn’t want to get caught on the beach when it disappears. We were surprised at the low number of people on this beach. We saw a few children playing on a couple of different walks, but for the most part, we had it to ourselves. It’s the biggest beach I’ve ever been on, and the most empty. I was filming Amelia and she saw a whale breaching behind me. 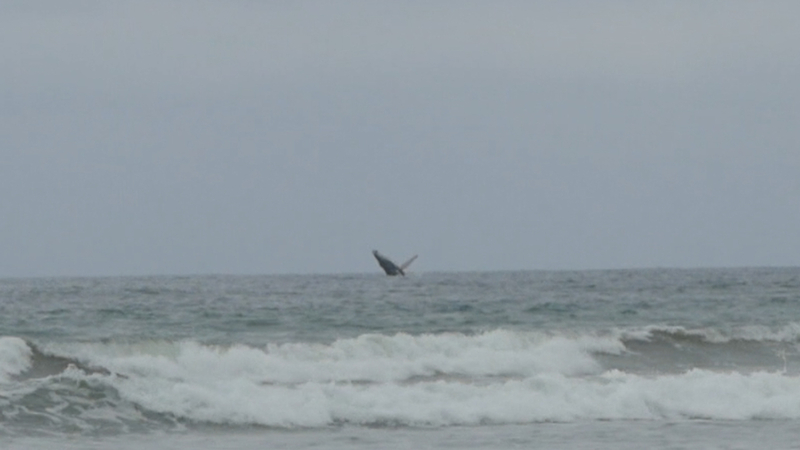 I trained my camera on the spot and luckily caught this big Humpback Whale breaching just a short distance offshore. We saw Humpbacks from our balcony and the beach on several different days. 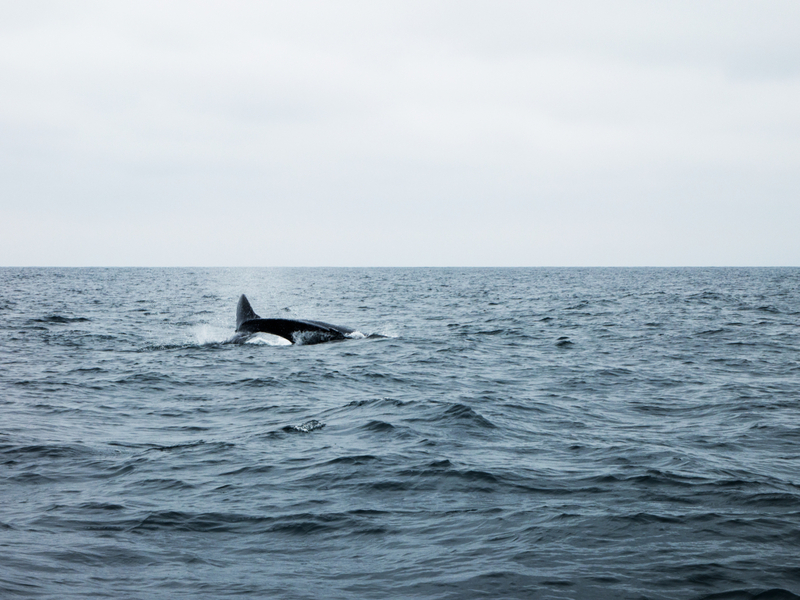 On the last morning of our trip, we saw a pod of Killer Whales from our breakfast table at the B&B. You’ll see more whales up close and personal on our whale watching tour in the next video. 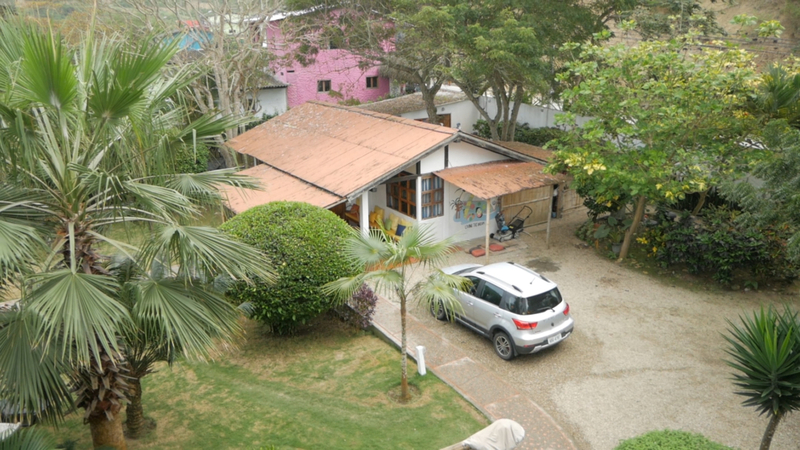 The beachfront between La Entrada and Olón had lots of big, beautiful houses. Some of them were for sale if you’re interested! However, with the rapid rise of the oceans, these houses will likely be under water in the next 50 to 100 years. The ocean is already knocking on their doorsteps at high tide. The first town we stopped at on our walk to Olón and Montañita was La Curia. 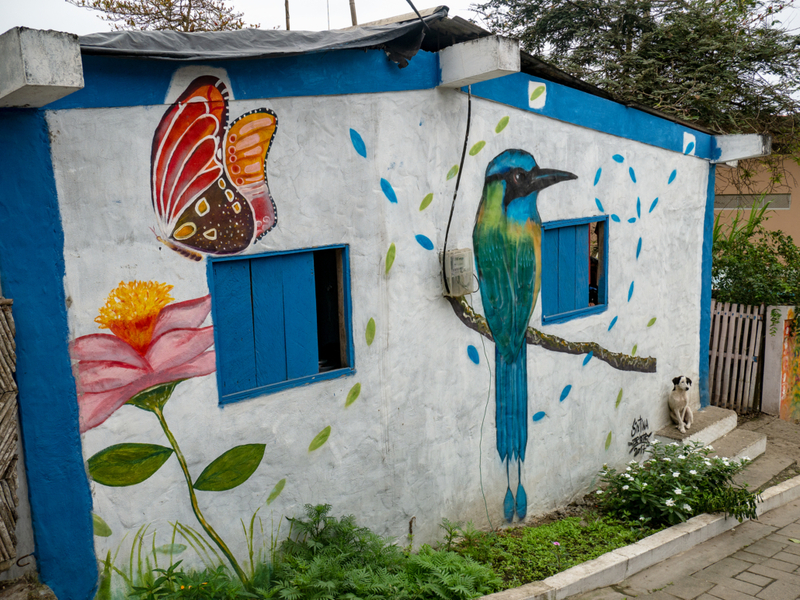 It was a tiny little pueblita with a church, lots of chickens and, of course, several street dogs. 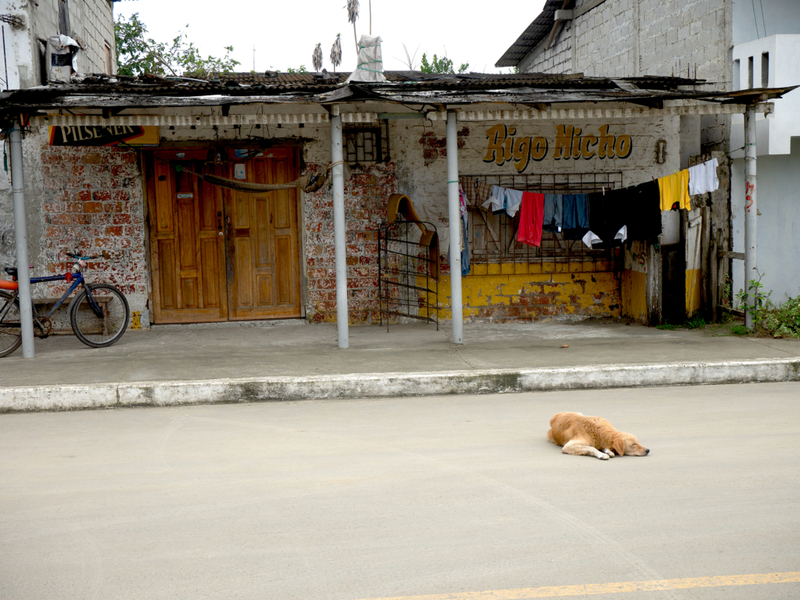 There wasn’t much (any) traffic in town so this dog was taking a mid-morning nap in the middle of the street. These guys were more than happy to let me take a picture of their cool mural and old building. 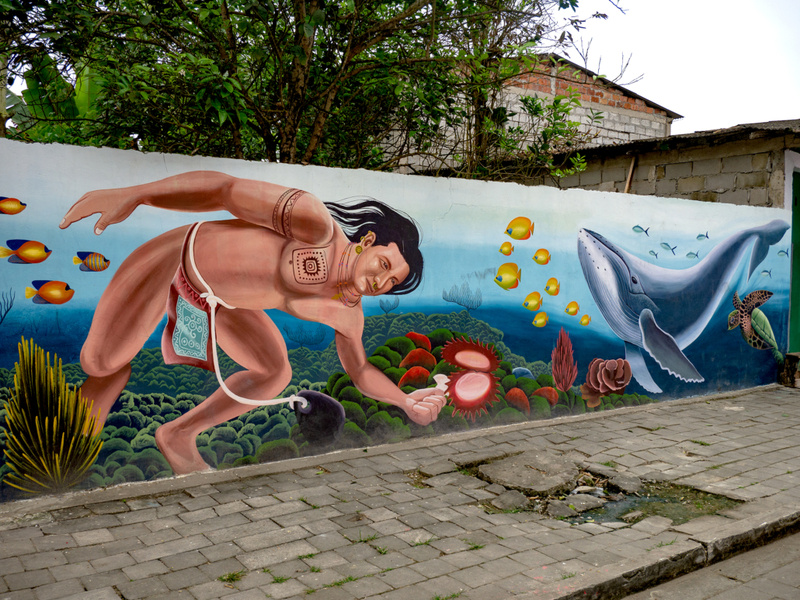 Murals are very popular in Ecuador. The tiny pueblita of La Entrada has over 25 and growing. This is a real fixer-upper. 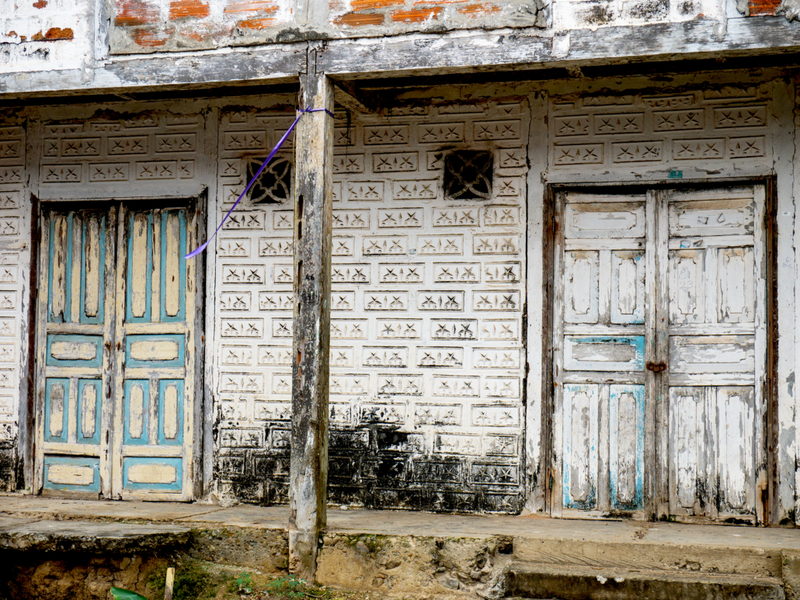 We saw lots of these run-down old buildings and houses in the pueblitas along Ecuador’s Southern Coast. La Entrada is the rare exception. Most of the old buildings have either been torn down or renovated there. 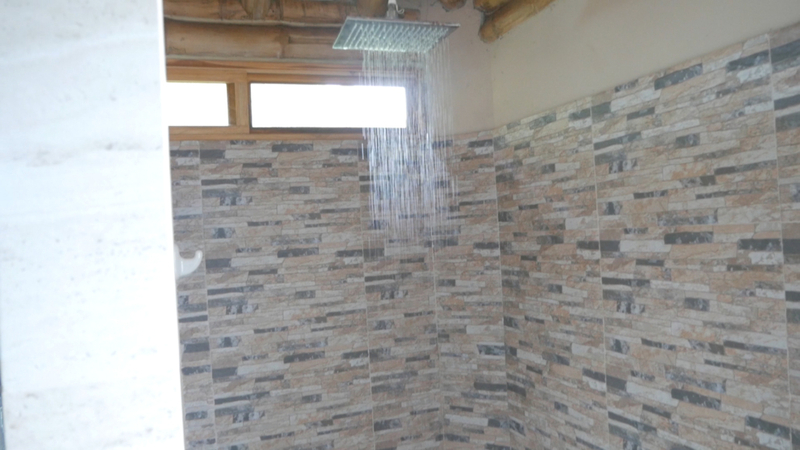 The people of La Entrada have a large rehabilitation project going on, spearheaded by Shell, the owner of Villa de Los Sueños. You can see more of the La Entrada in a future video. Everyone in La Curia was super friendly, and showed off their big smiles and happy greetings to the wondering gringos. 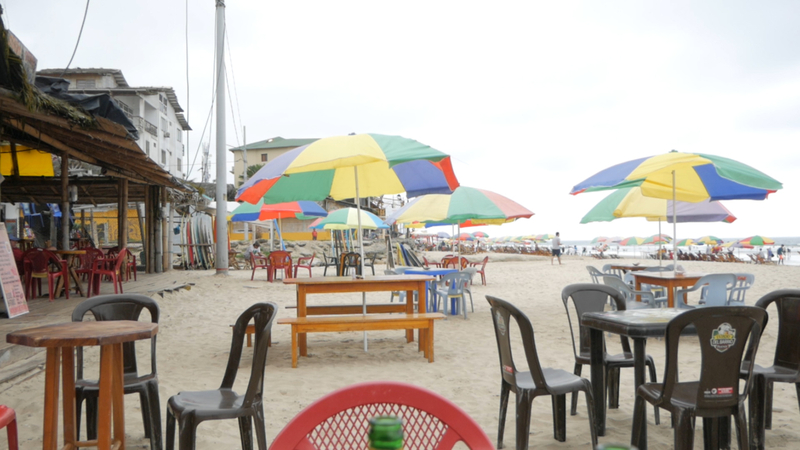 Our next stop on the beach walk was Olón. It’s a larger town than La Curia and popular with surfers. 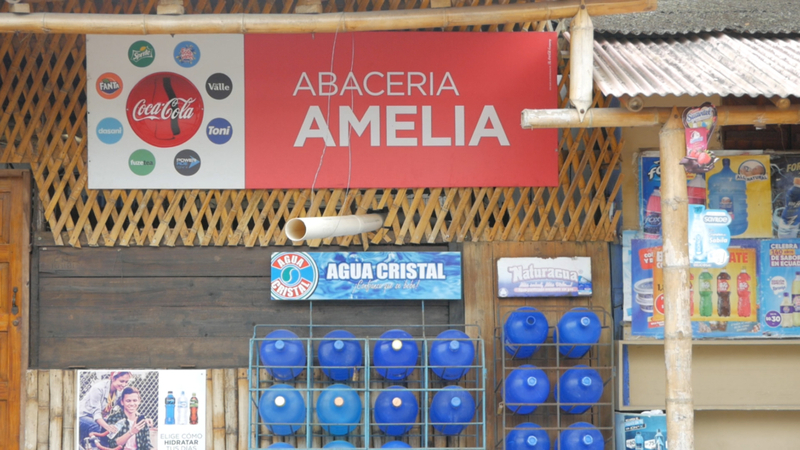 We spotted this sign that sparked Amelia’s fancy. 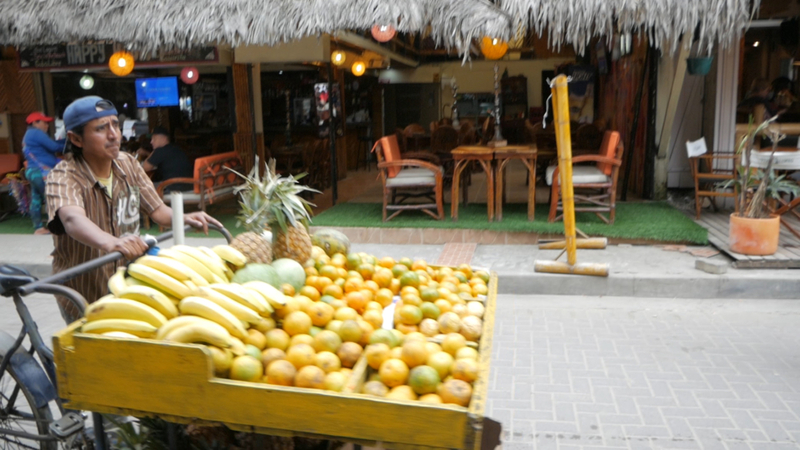 We were starving by this point so we walked straight through Olón and got on a bus to Montañita Ecuador. 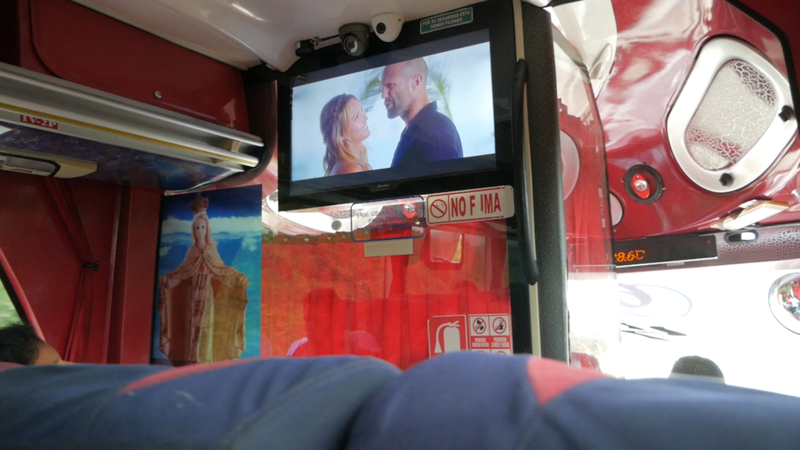 We were surprised to see them showing a movie with Jason Statham, dubbed into Spanish. It’s quite funny to hear a deep, sophisticated latino voice coming out of The Transporter! 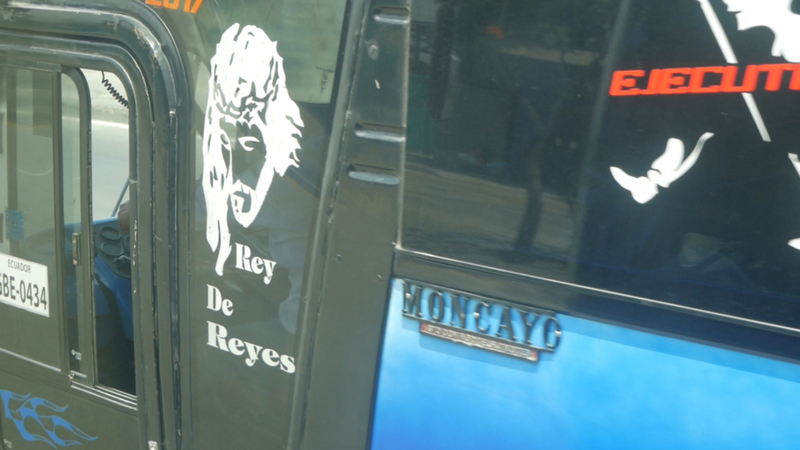 The bus ride between Olón and Monañita took about 10 minutes and cost us 50 cents each. 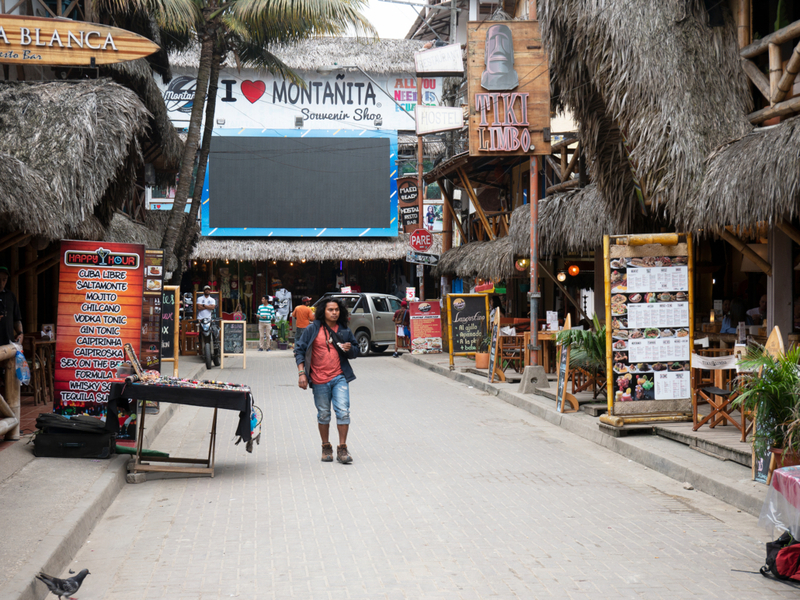 Montañita is known as a party town. 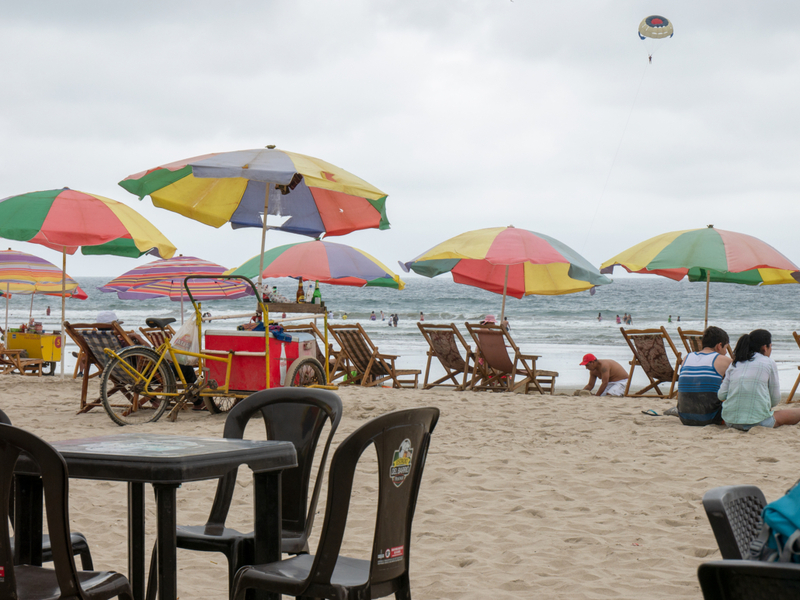 Young people come from Guayaquil and other parts of Ecuador on the weekends to party and surf. This picture was taken atop the 10 foot high retaining wall, or malecon in Spanish. 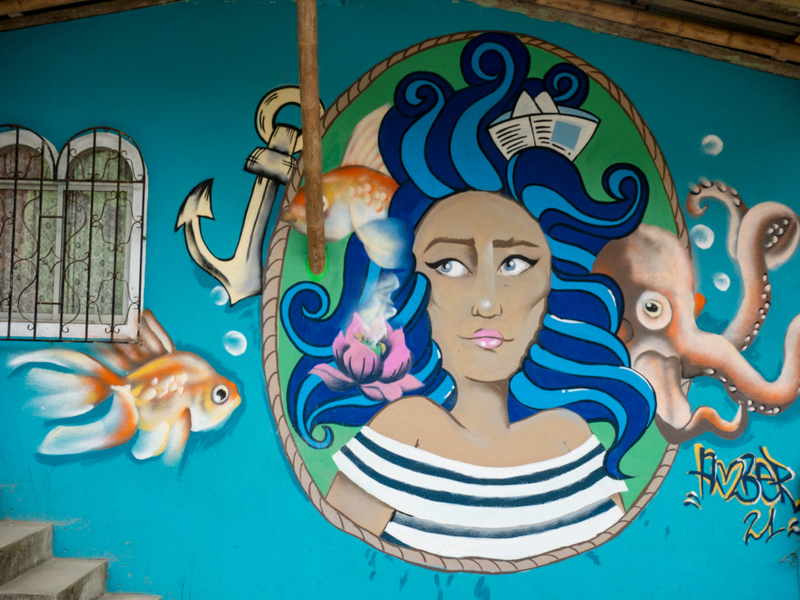 The ocean is already creeping up to Montañita’s doorstep and this wall helps keep out the high tide and storm surges. 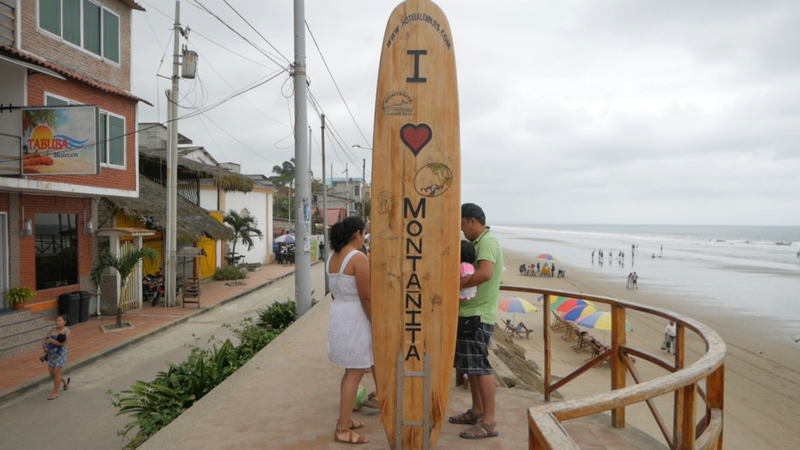 Montañita is quite the tourist town. It reminds me of pretty much every beachfront tourist town I’ve been to in other parts of the world. Nearly every store is either a restaurant or souvenir shop. Believe it or not, we saw cars driving down these streets. However, most vehicles were push carts like these that were selling or transporting things to local shops. 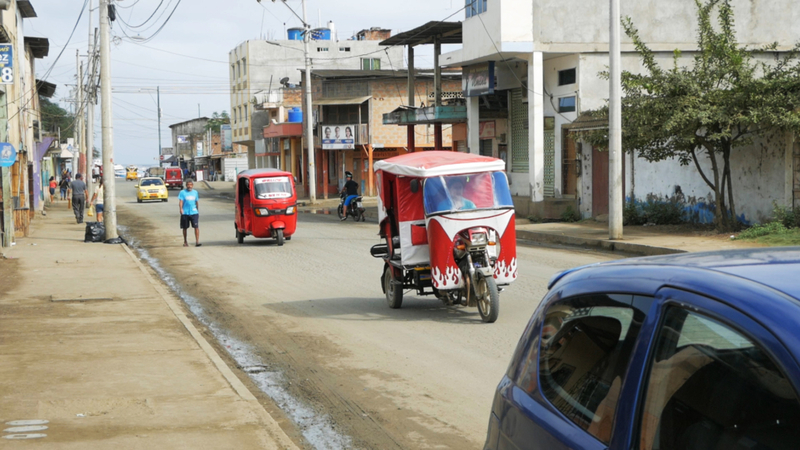 While Ecuadorians do love their helado (ice cream), we have yet to see an ice cream truck. 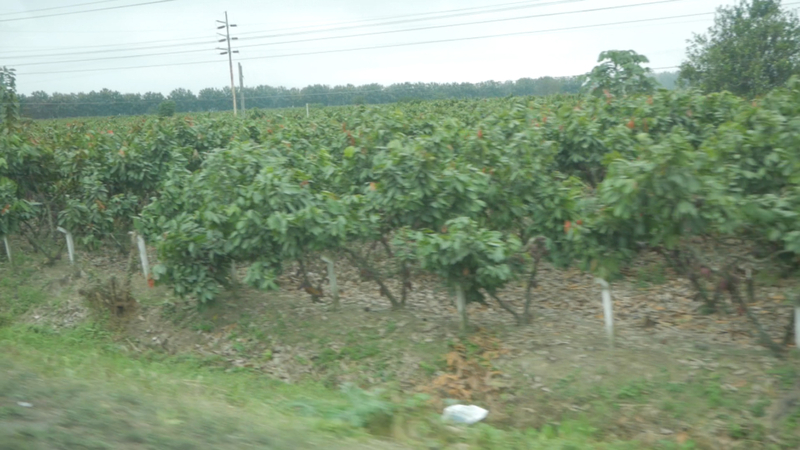 Instead, these types of fruit carts and stands can be found everywhere. Most of them will even cut up the pineapples for you. 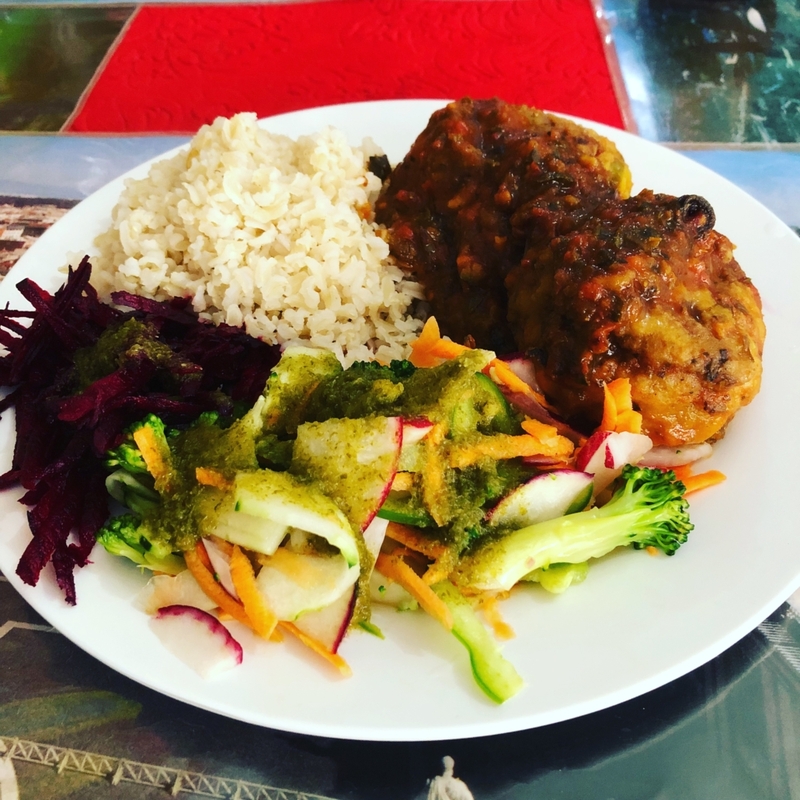 Amelia found this vegan restaurant, Amor Infinito, on TripAdvisor.com. When we left the B&B, our goal was to have lunch here, but since the walk took much longer than an 8K walk should take, we had a very LATE lunch here. 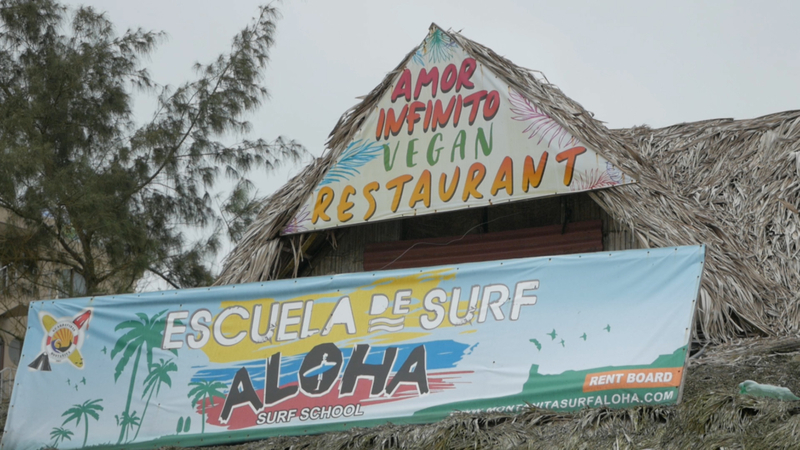 We really enjoyed the vegan food and beachfront seating at Amor Infinito. I talked to the owner and he said his wife decided they needed to eat a healthier diet, so they changed the restaurant to all vegan. They offer a daily almuerzo (lunch special), as well as vegan cerveza and other beverages. The food was delicious! It came with fresh squeezed juice, the main course (see pic above) and fresh fruit for dessert. We went to the coast during the off-season, so there weren’t many people on the beach. However, all of the tables at Amor Infinito were full (see above) while the neighboring restaurants were nearly empty (see below). I think that says a lot about the quality of the food and the growth of veganism. 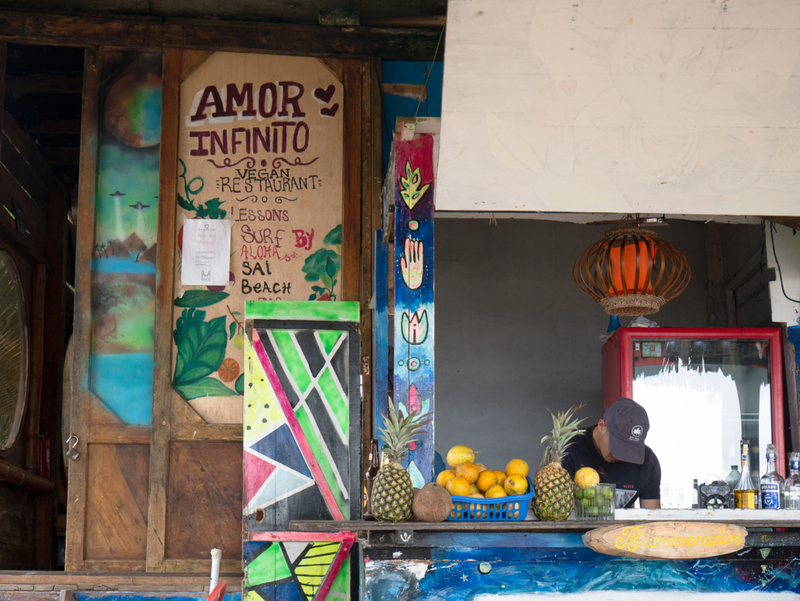 We highly recommend checking out Amor Infinito on your next trip to Montañita. I swear Amelia could spot a vegan restaurant from space! We were walking down a busy, crowded, visually stimulating street and Amelia spotted this restaurant from more than a block away! Carlos is the owner, cook and waiter of Govinda Prasad. He’s also a great baker (more on that below). We ate lunch at his restaurant two different days and really enjoyed the food. 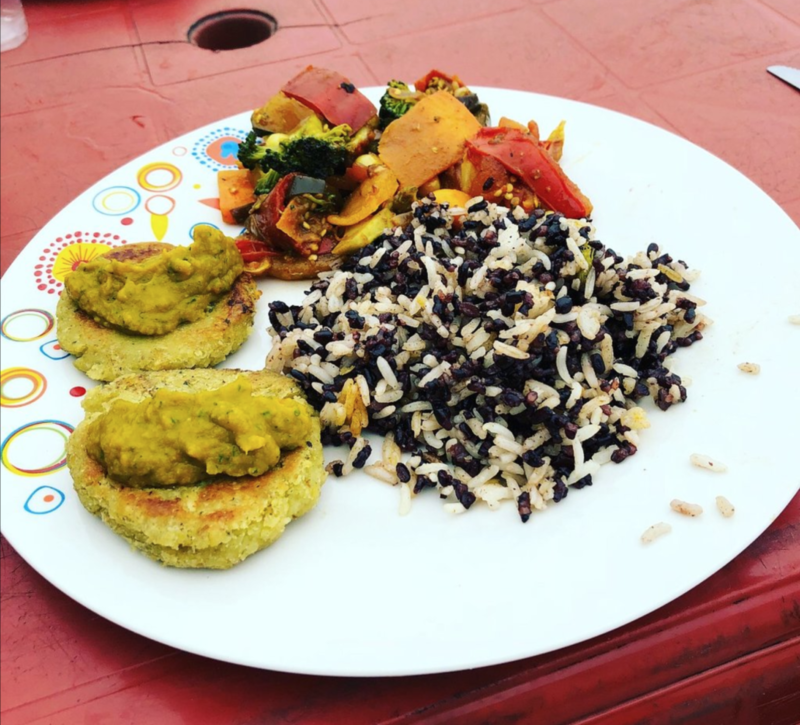 In addition to being plant-based vegan, our lunches also had very little to no oil, making them the healthiest dishes we ate in Montañita. We loved all the fresh veggies! In this part of Ecuador, most of the bread is made with manteca (aka lard). As vegans, we avoid all animal products. As healthy plant-based eaters, we wouldn’t dream of eating lard or anything like it! 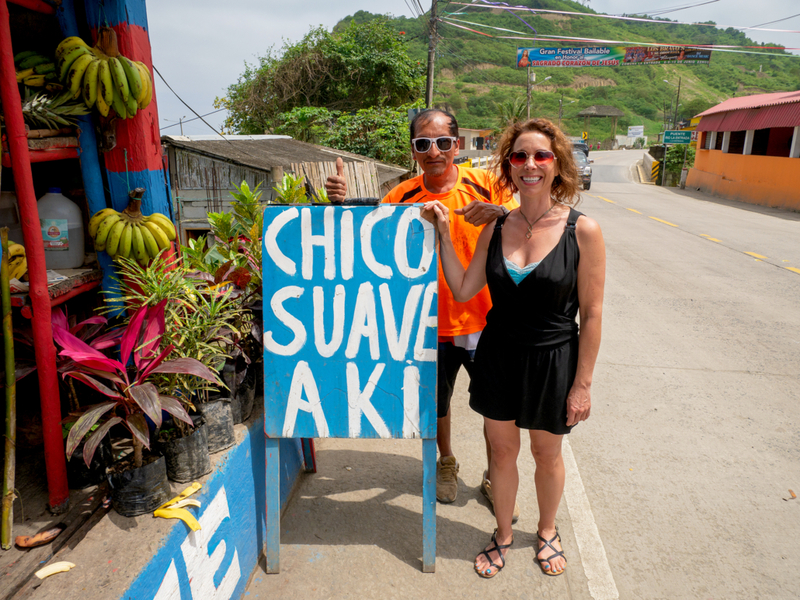 We had a hard time finding lard-free bread on the coast, so we asked Carlos if he knew where we could get some and he offered to make it for us. Since they’re fresh-baked, he needed a little notice and had them ready for us the next day. We went back the next day and he had two loaves of whole wheat oat bread ready for us, fresh from the oven. They were still warm! He sold them both to us for $5. They were so good that we went back on our last day at the coast and bought two more loaves for the trip back to Cuenca. 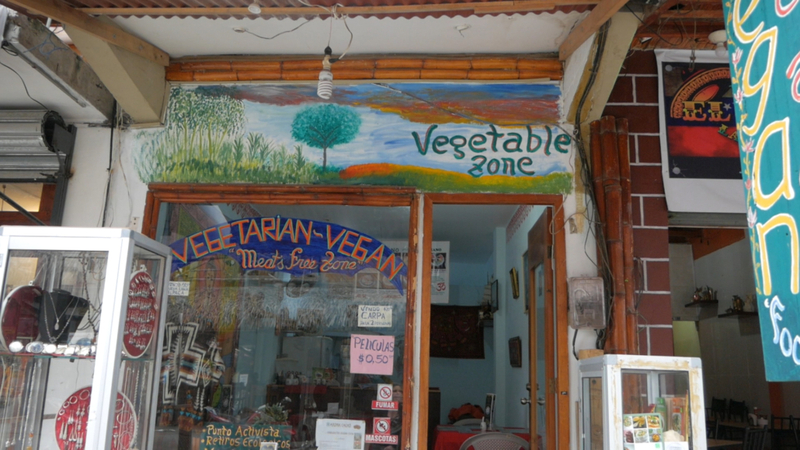 We highly recommend this restaurant and Carlos’s healthy vegan bread on your next visit to Montañita. 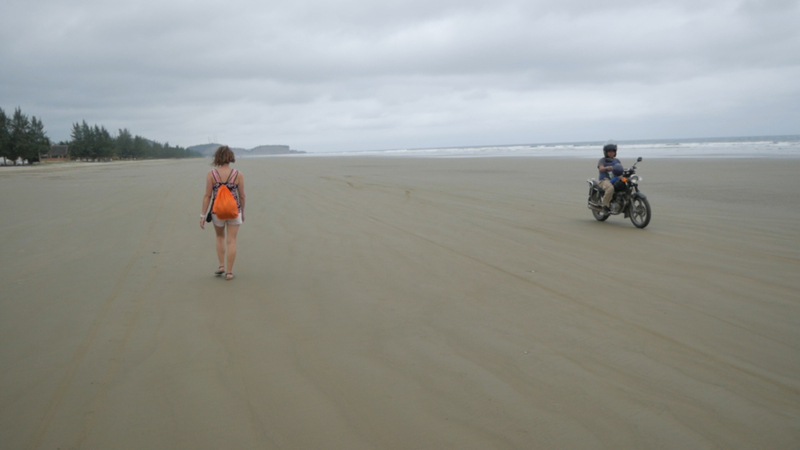 We hope you enjoyed the second part of our trip on Ecuador’s Southern Coast. Please remember to like, comment and share our video, and also subscribe to our YouTube channel. If you’d like us to make a video about something specific or if you have questions, please let us know in the comments. 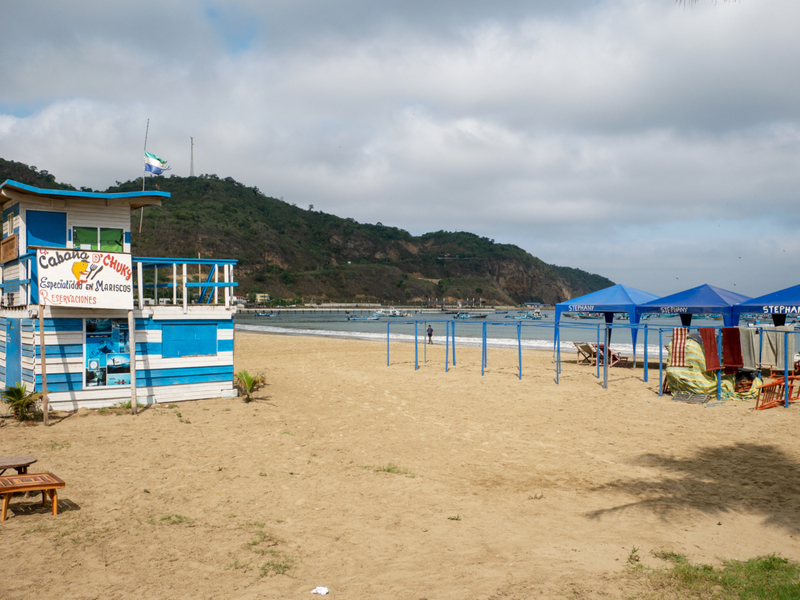 This was our first trip to Ecuador’s Southern Coast and we LOVED IT! 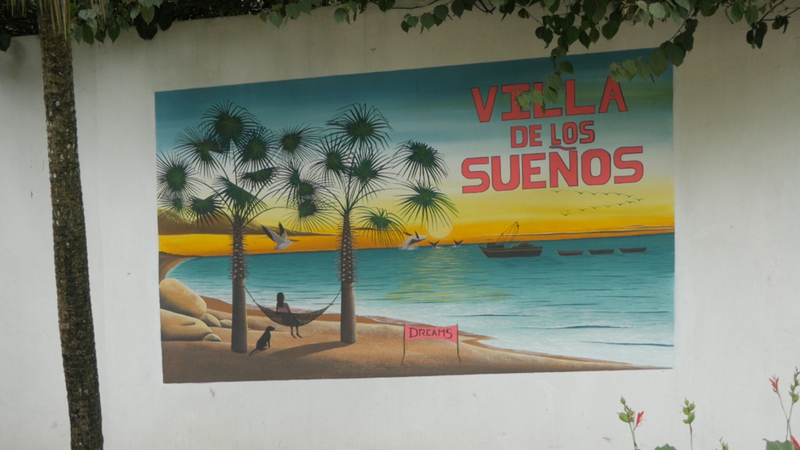 We’d heard great things from our friends about Ecuador’s beaches, Montañita and the Bed & Breakfast where we stayed, Villa de Los Sueños. And they were right! It was amazing! 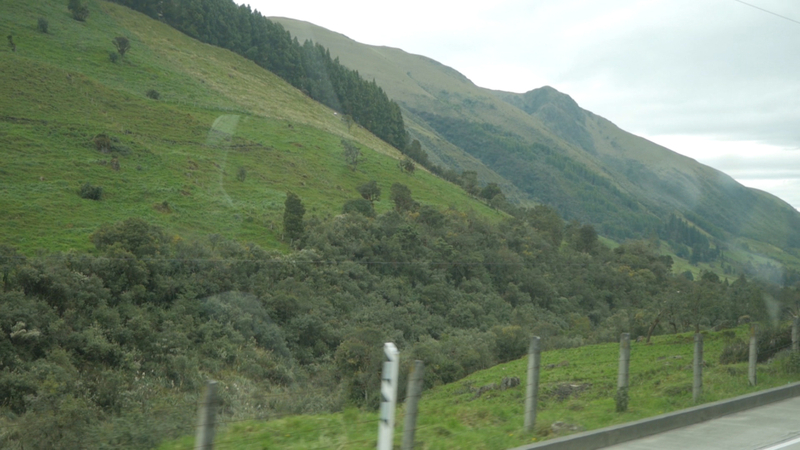 This video covers our trip from Cuenca, Ecuador to La Entrada, Ecuador where Villa de Los Sueños is located. 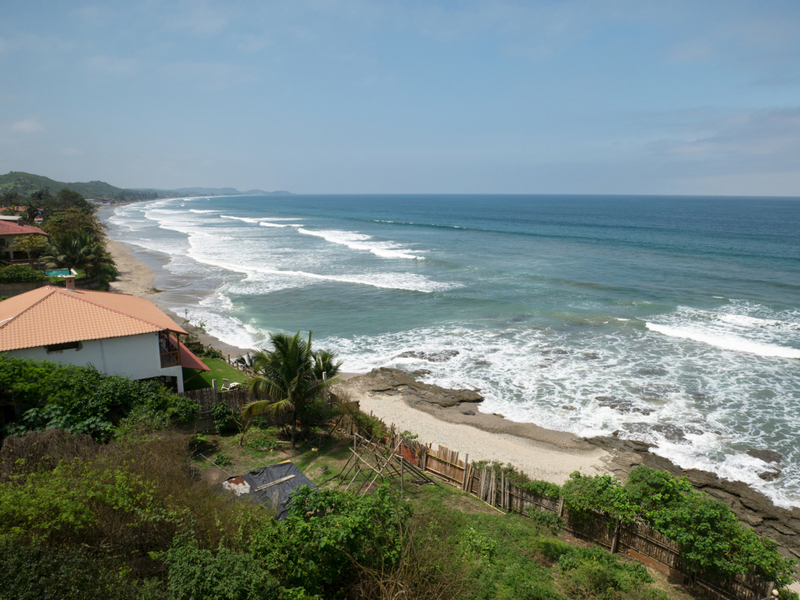 La Entrada is about a 20 minute drive north of Montañita, Ecuador. 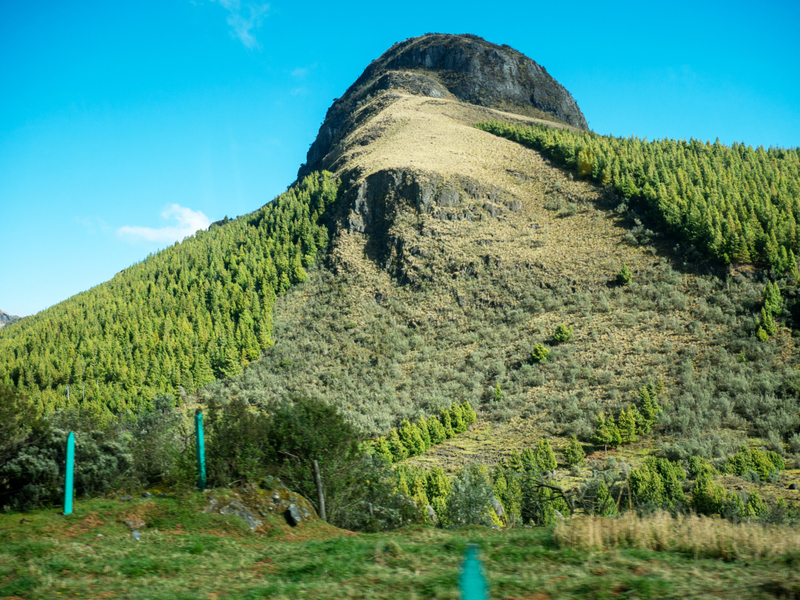 We hope you enjoy seeing the beautiful scenery, and the interesting people we meet along the way on our journey to Ecuador’s southern coast. 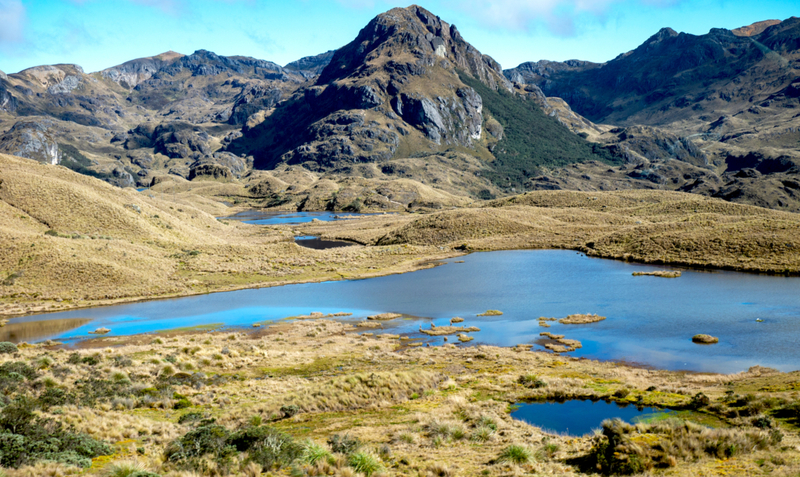 El Cajas National Park is about a 30 minute drive east of Cuenca, Ecuador. It’s located in the highlands of Ecuador and looks like it’s from another world. 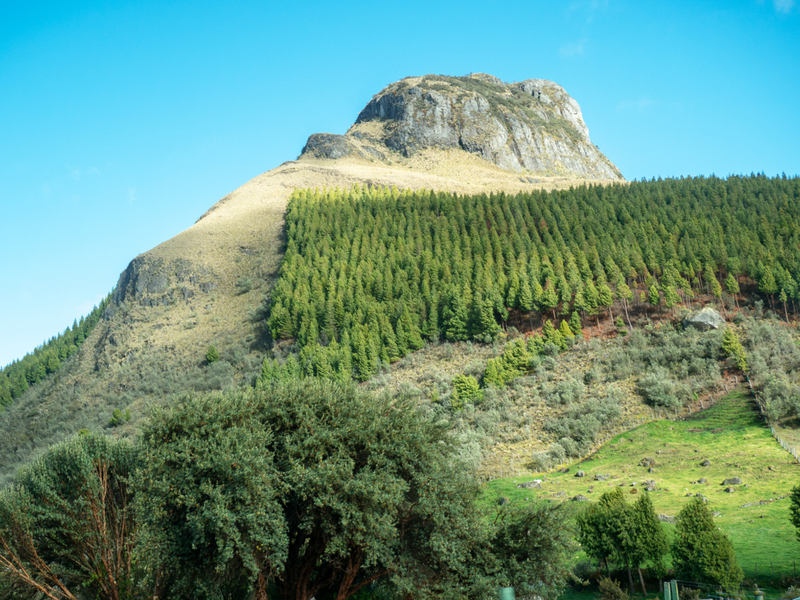 El Cajas has lots of these perfectly rowed trees. That’s not a genetic mutation; they’ve been planted. 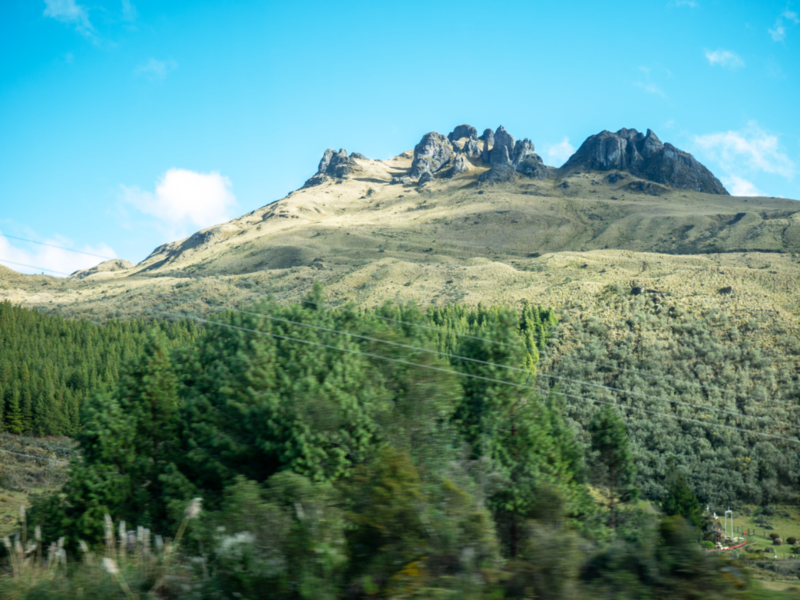 We were told that during World War I and before, every tree in Cajas was cut down for timber used to build things, including the war machine. 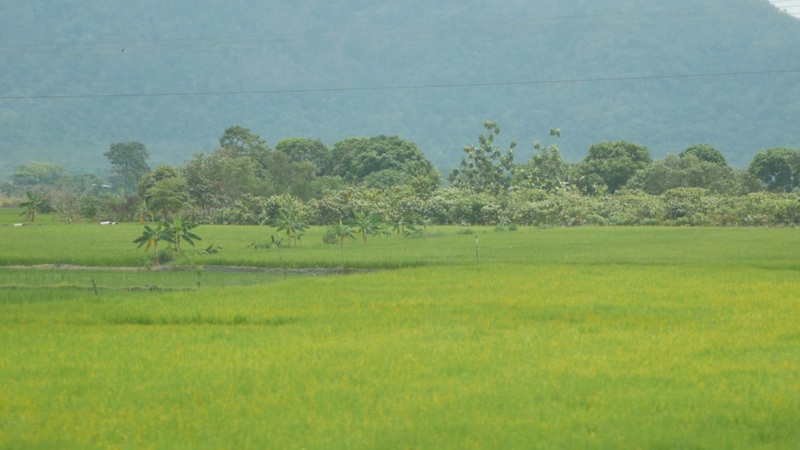 Over the past 30 years, they’ve been planting trees to regrow the forest that once stood there. It’s kind of a shame that they planted them so geometrically, though. Perhaps a random pattern would be more authentic? 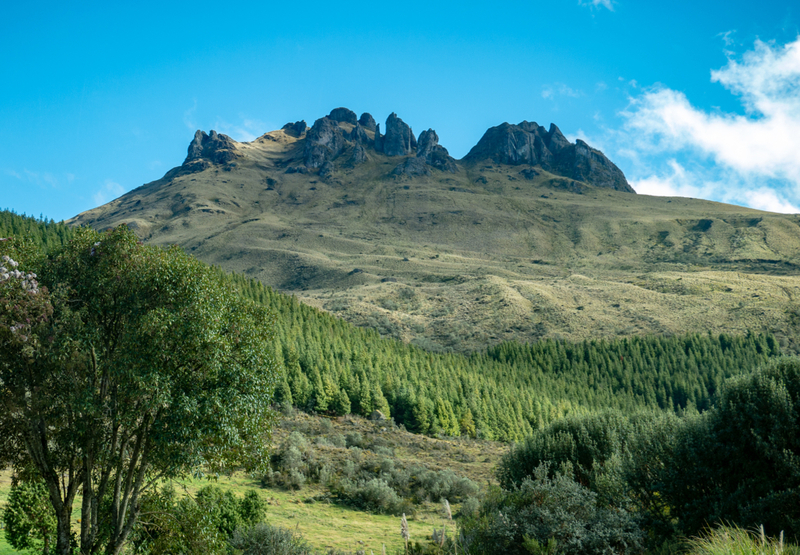 El Cajas has lots of hiking trails and it’s home to the world’s largest hummingbird. That makes this a popular place for hikers and bird watchers. However, the weather is very unpredictable and the trails aren’t clearly marked so plan accordingly. Bring layers of clothes, food, water and a GPS so you can find your way back to your car or the bus stop. It truly is otherworldly. This looks like it could be a scene from a sci-fi movie. A beautiful mountain lake. We’ve been told you can hike around this one. 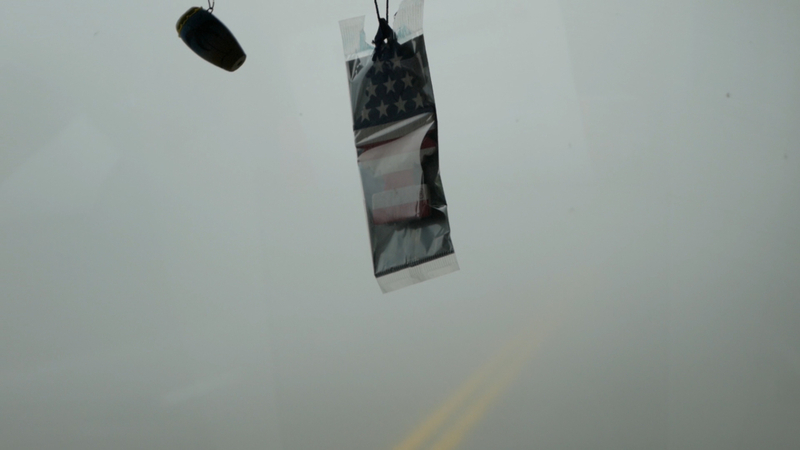 You may notice the American flag air freshener hanging from the rearview mirror, but that’s not the point of this photo. Just below that are the yellow lines of the road. 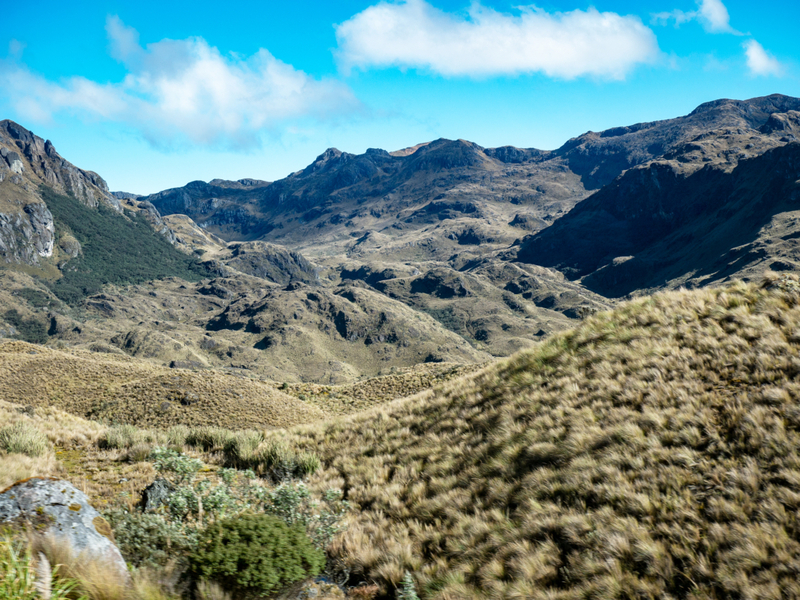 On the eastern side of Cajas, it’s common to drive down (or up) through the clouds. A few meters before this picture was taken, we were in bright blue, sunny skies. The fog is often so dense on this part of the drive that you can barely see the yellow lines. It’s quite terrifying! 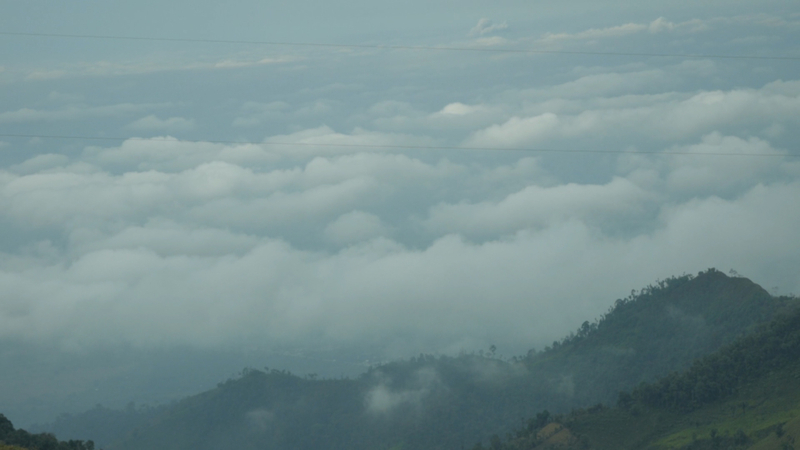 A little further down in altitude is a tropical rainforest. 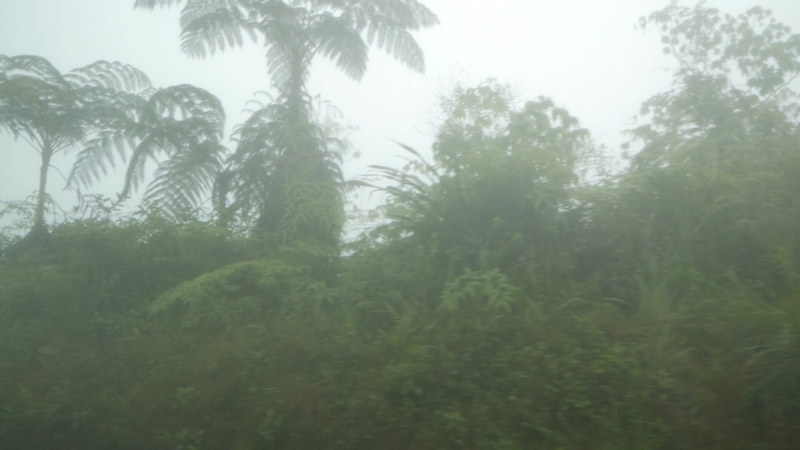 This part of the drive lasts about 20 to 30 minutes with lush green foliage and palm trees often blanketed in a shroud of fog. 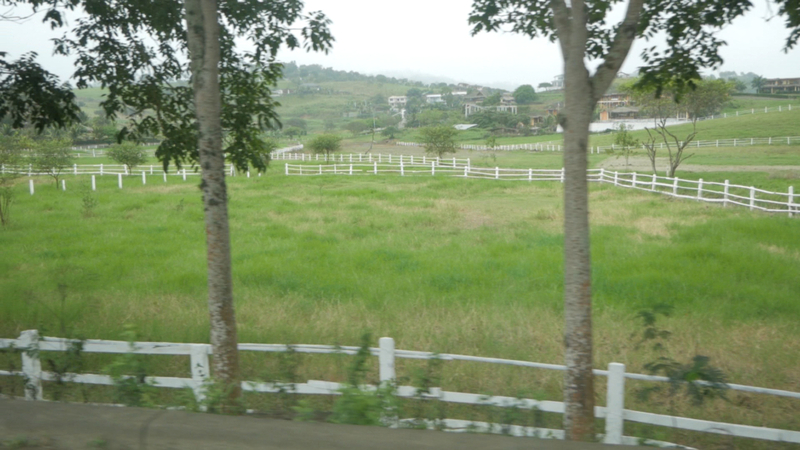 Once we left the rainforest, we entered the flat plains on the way to Guayaquil. This isn’t a great picture since we were in a rapidly moving buseta (a small passenger bus operated by Operazuaytur), but these are cacao trees (bushes?). Ecuador is known for its amazing, high quality chocolate and most of Ecuador’s cacao is grown in this region and south of here. Cacao is a very picky plant and will only grow in very specific conditions near the equator making this area perfect for the beans that will become the magic dark brown elixir to the gods. 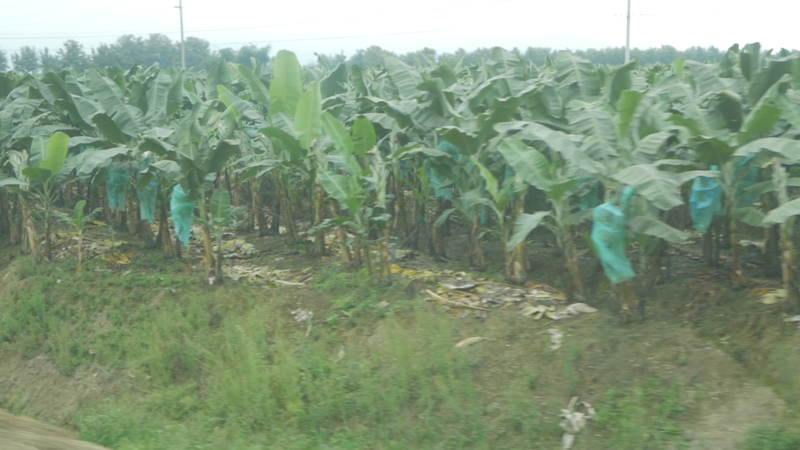 Ecuador is also a huge exporter of bananas. We used to buy Ecuadorian bananas in Denver. They’re covered with plastic bags to minimize pesticide exposure. Hopefully, they recycle all that plastic. 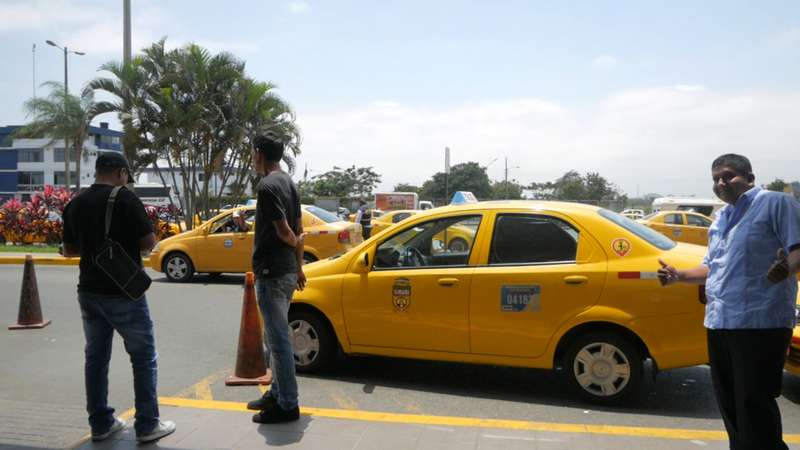 There are several toll booths between El Cajas and Guayaquil. A car costs 25 cents if I remember correctly. 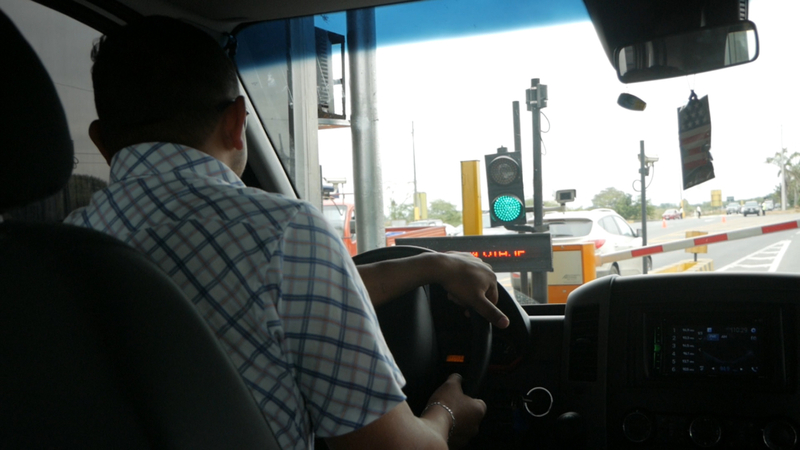 Commercial vehicles like the buseta that we were in have different rates, apparently based on the number of people since I heard the driver tell the toll booth attendant how many people were onboard. 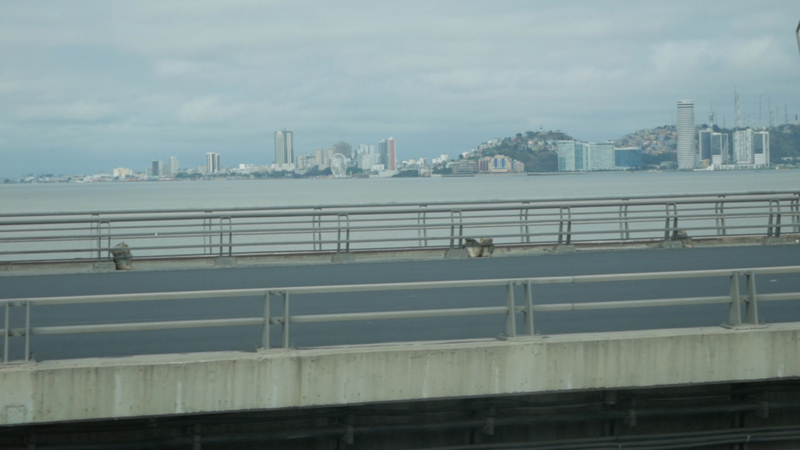 A long bridge over Río Guayas delivered us into the heart of Guayaquil, Ecuador, just south of the airport and bus terminal. 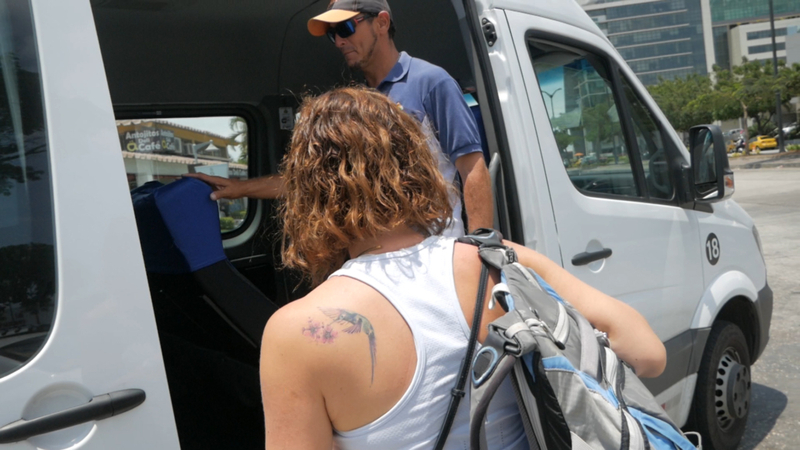 The busetas are run by a private company with their own drop off location near the airport. When we got off the buseta, a line of taxis were waiting to take people to places unknown. 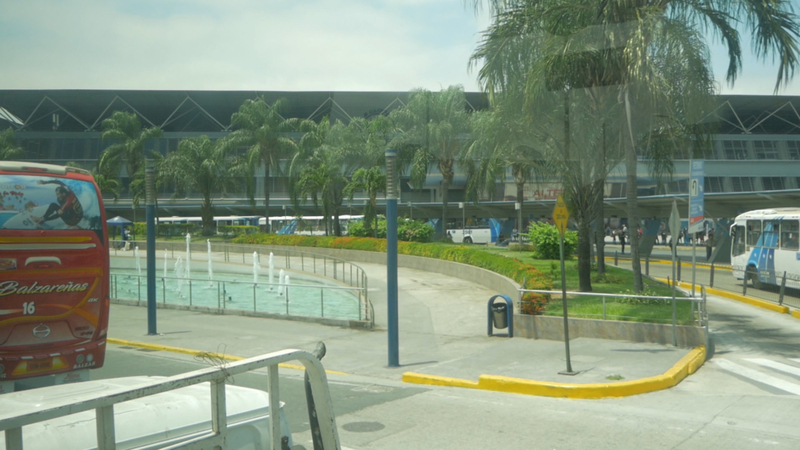 Our plan was to take a taxi to the bus terminal, which was about a 5 minute drive away. 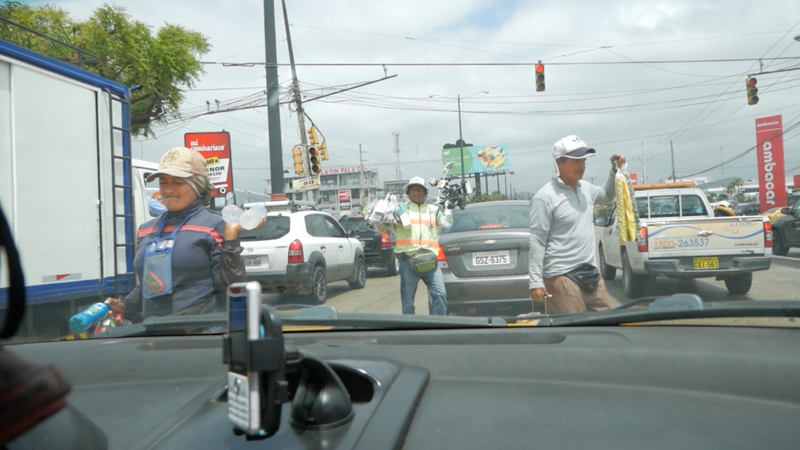 However, the taxi driver asked us where we were going and offered to drive us all the way to Montañita, Ecuador for $80. It took us less than 3 hours in a taxi, but the bus ($7/ticket) takes between 4 and 5 hours. My back was already hurting from the buseta ride, so we decided to take him up on it. Sadly for him, he got a speeding ticket about halfway there. He was going 9 kilometers over the speed limit (that’s about 5 miles/hour). 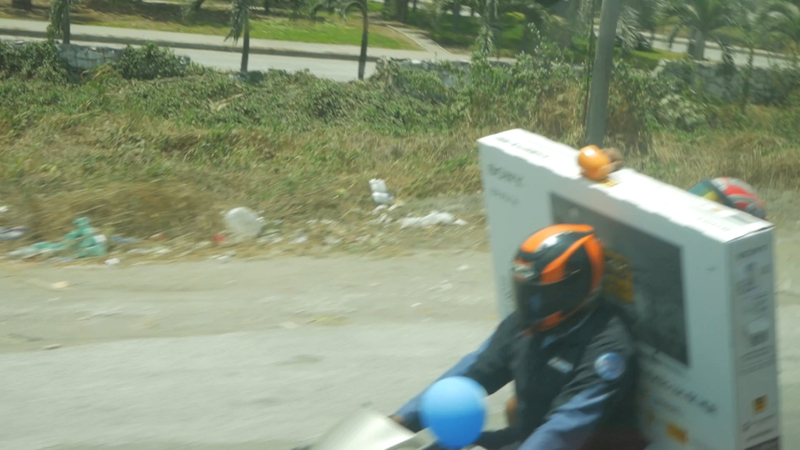 I’m pretty sure a taxi on the highway with two gringos in it had something to do with that ticket…. 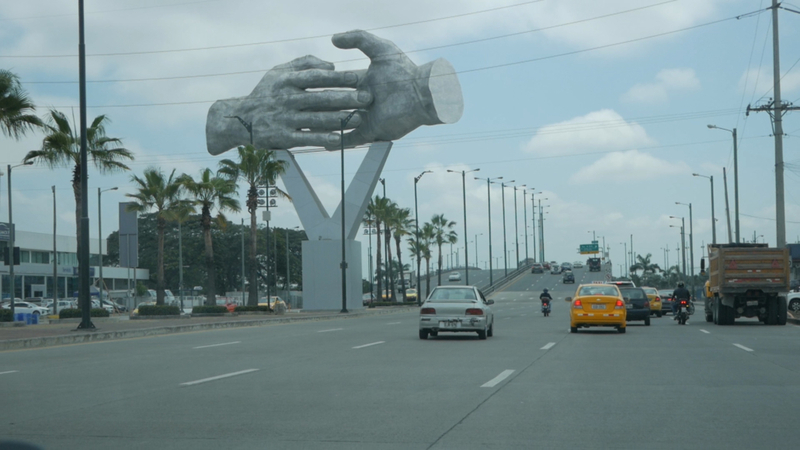 Ecuador has lots of these giant sculptures along the major roads. 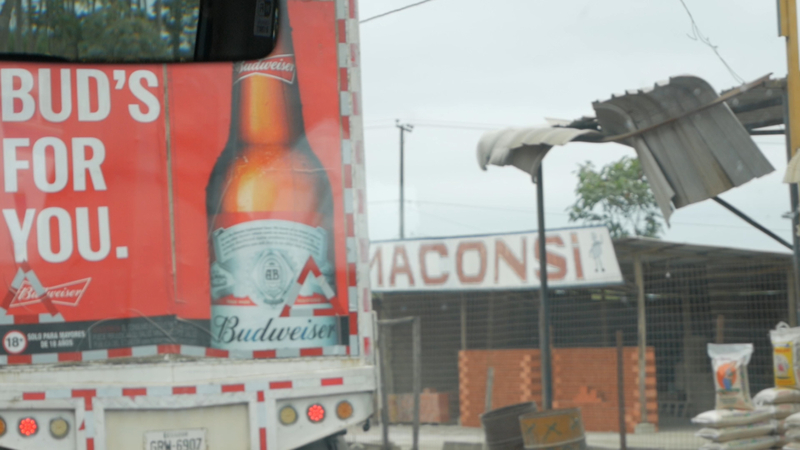 We’ve noticed more of them in Guayaquil and Quito than in Cuenca, but Cuenca does have a few unique sculptures. 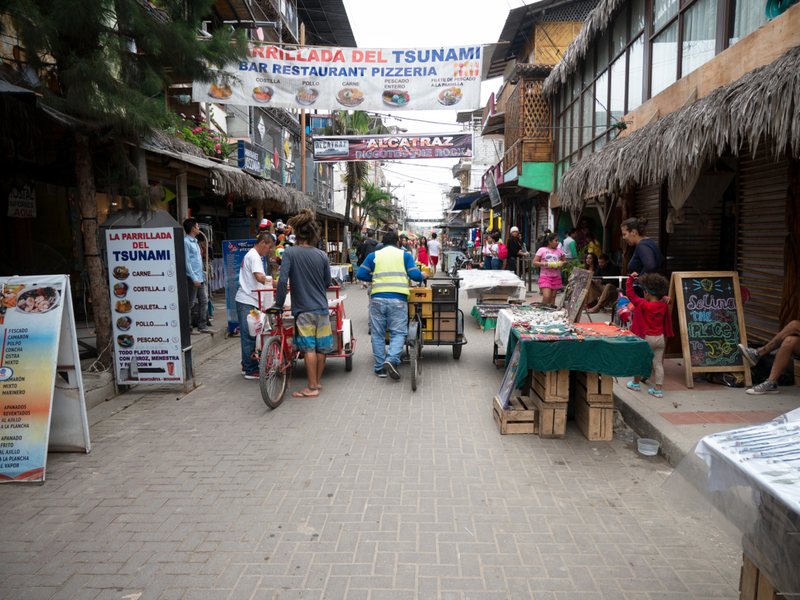 Street vendors are also common throughout Ecuador. 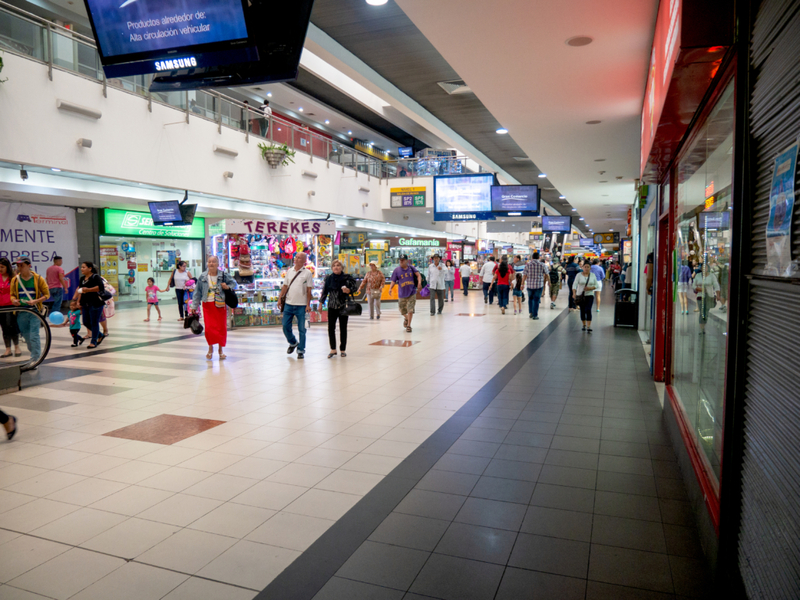 As soon as the light turns red, people come from out of nowhere selling everything from bottled water and food, to electronics and floor rugs. It’s like IKEA comes to you for 2 minutes, and then disappears into thin air! 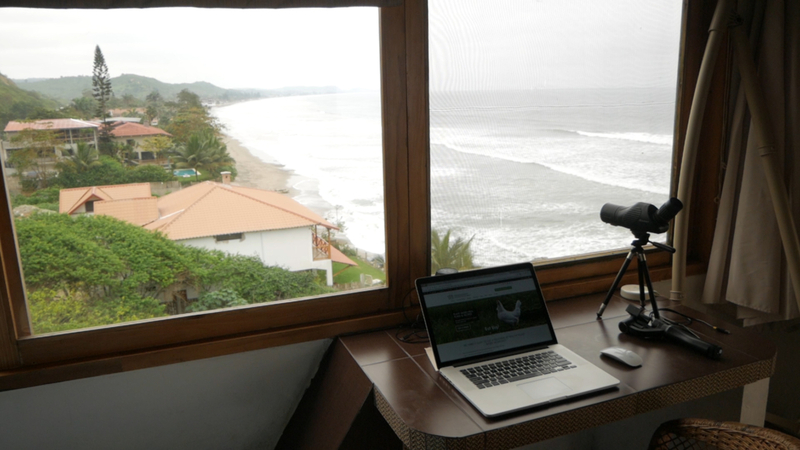 The first ocean sighting may not look like much, with beachfront shacks galore. 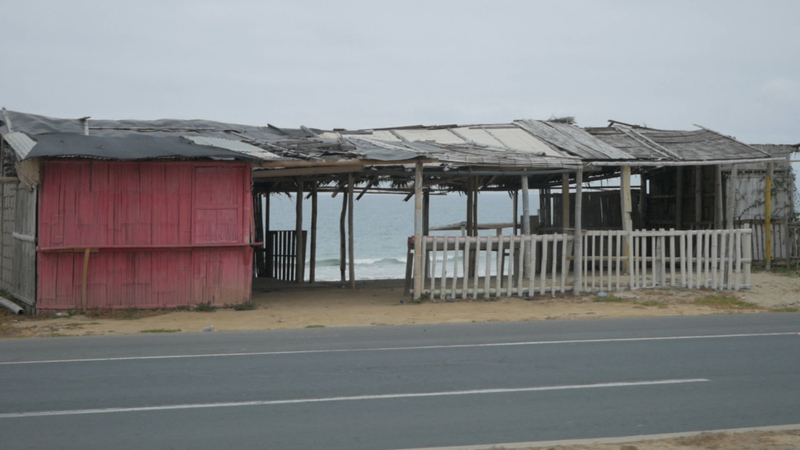 But these are actually fishing shacks that are bustling with activity in the mornings. The fishermen go out in their boats at night and return in the morning to sell what they caught. As vegans, we’re not in support of this activity, but these aren’t giant commercial fishing boats dragging nets behind their boats for miles scraping everything off the seafloor and capturing everything from fish to dolphins, turtles and baby whales. These are tiny fishing boats with one or two guys on them. They’ve been doing this for generations so convincing them to stop won’t be easy. My guess is they’ll be forced to stop in the next 20 years when there are no more fish to be caught and the oceans are dead thanks to the industrial fishing operations. Please, for your own health and the survival of our oceans, stop buying seafood! This is an oil pipeline dock that goes out into the sea. On the other side of the highway is what appeared to be an oil holding station. It wasn’t a refinery; it only had large storage tanks. I’m guessing they pump the oil from the tanks out to oil tankers. 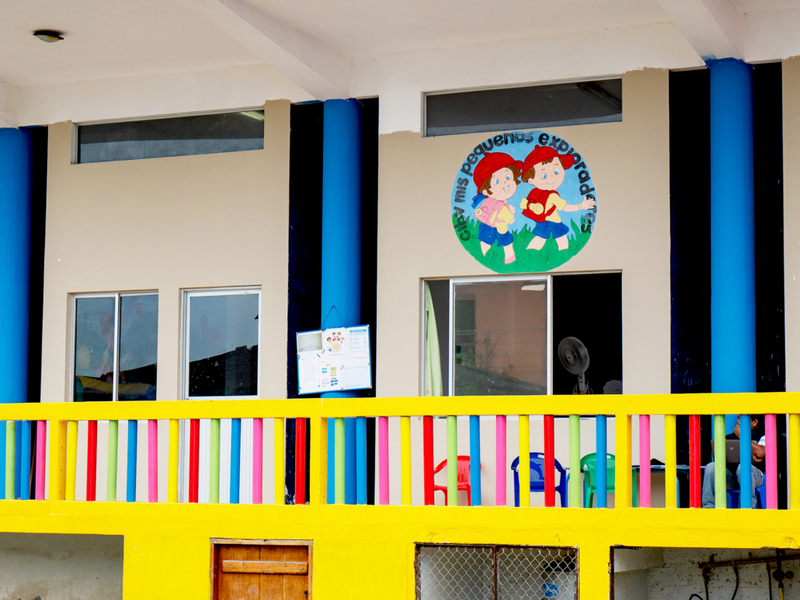 Before the oil bust, oil was one of Ecuador’s main sources of income. Now they have a more balanced portfolio with food and flower exports, some manufacturing, and tourism. We saw so many different types of terrain and climates on our short 6 hour ride from Cuenca to La Entrada it was sometimes hard to believe. Close your eyes for 5 minutes in a dessert and you might wake up in a rainforest! This picturesque farm looks like it could be a Kentucky horse ranch. On the other side of the highway from this ranch is the ocean and beaches. What a diverse country! The tide was out when we arrived and the rocky oceanfront off the back of Villa de Los Sueños was clearly visible. Most of the beaches in this area are very wide and sandy, but they’re rocky in front of the B&B. It was only a short 2 minute walk south on the beach to get to the sandy shores where you can swim or boogie board. Surfing is popular in Montañita and Olón a little bit south of La Entrada, but the waves weren’t quite big enough on this stretch of beach. 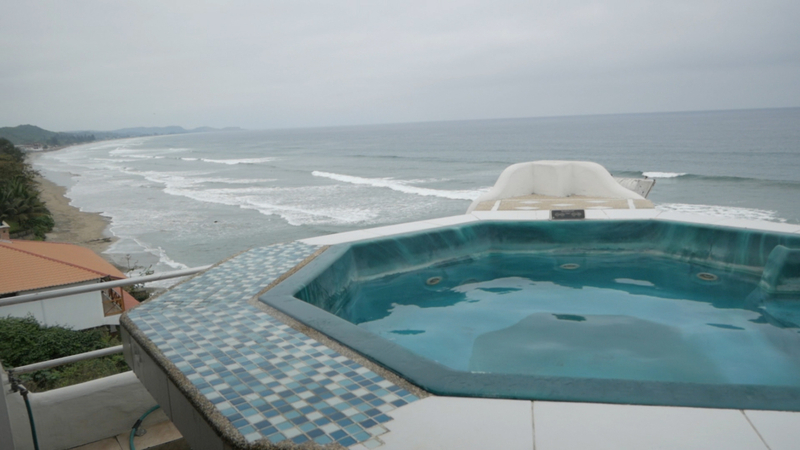 We rented the penthouse apartment, mainly for the kitchen so we could cook our vegan fare, but we were really happy with the larger room size, private hot tub and amazing views of the ocean. The owners are Shell and Marsha. On our first night there, Shell took us into Olón to buy some vegan staples such as fruits, veggies, rice, pasta and hot sauce. We cooked several meals in our room and had romantic dinners with ocean views and sounds. 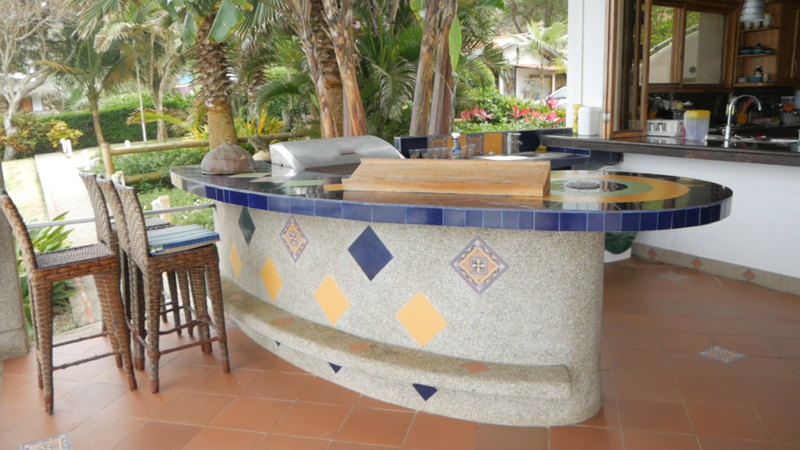 We’ll share more about our amazing, relaxing stay at Villa de Los Sueños in Part 3 of this series. 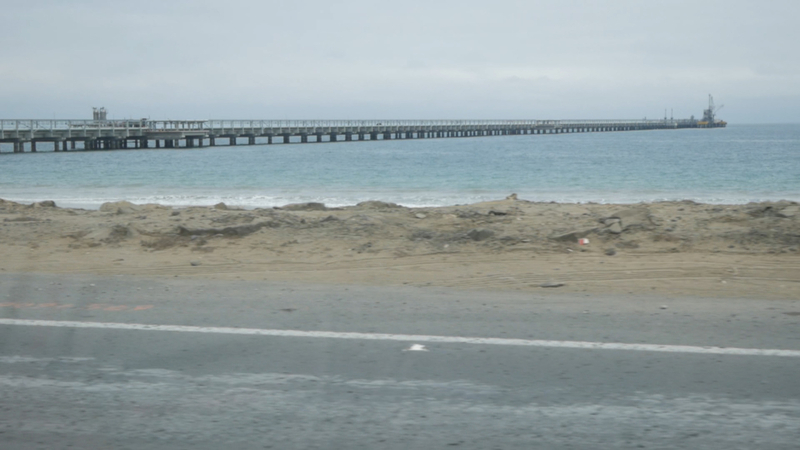 We hope you enjoyed the first part of our trip to Ecuador’s Southern Coast. Please remember to like, comment and share our video, and also subscribe to our YouTube channel. If you’d like us to make a video about something specific or if you have questions, please let us know in the comments.